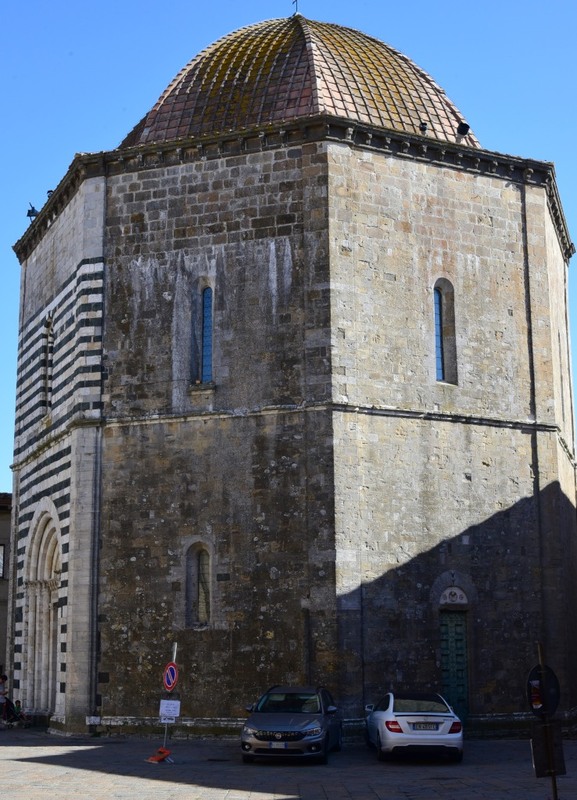 The old town of Montecatini Val di Cecina includes the Palazzo Pretorio, with an elegant porch running underneath a cross-ribbed vaulted roof supported by six Ionian columns, and the San Biagio church, built in the 14th Century, asymmetrical in shape, with an unadorned portal facing a side street. 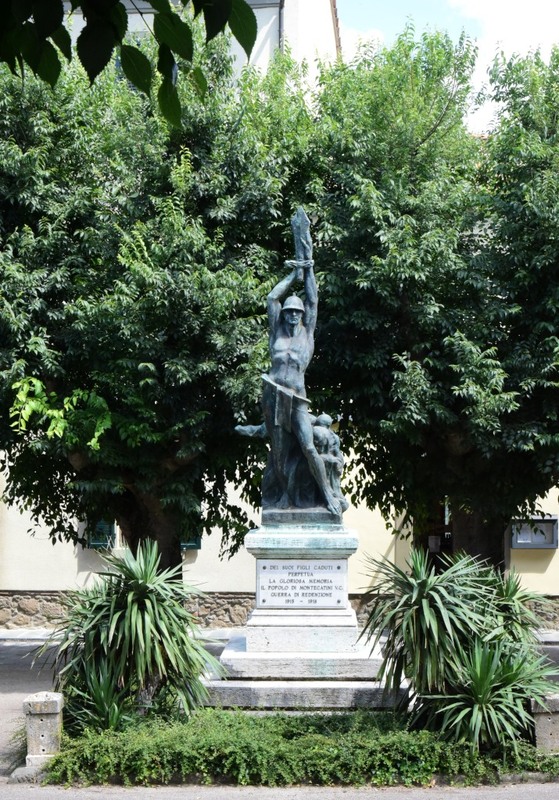 Since ancient times, Montecatini Val di Cecina was associated with its copper mine, and one of the biggest mining industries in Europe in the early 20th century, the Montecatini – Società Generale per l’Industria Mineraria e Chimica, which later merged in the more famous Montedison. 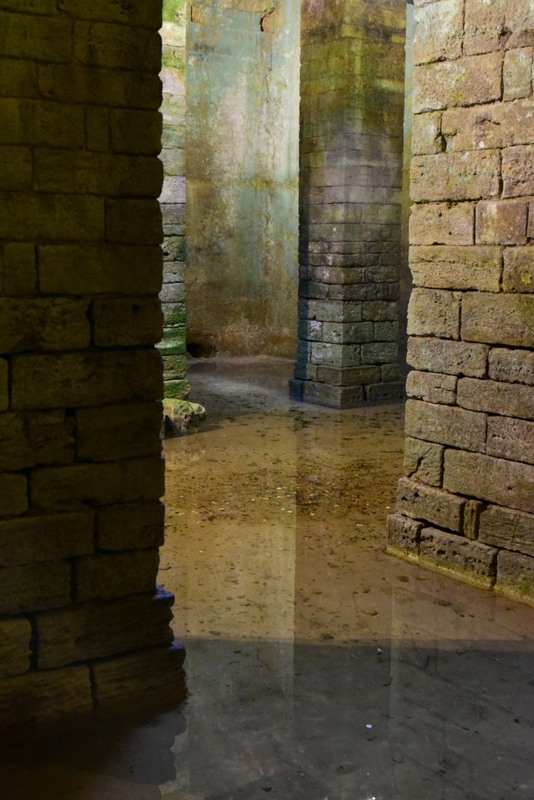 The mine remained operational until 1907, and has now been converted to a museum. 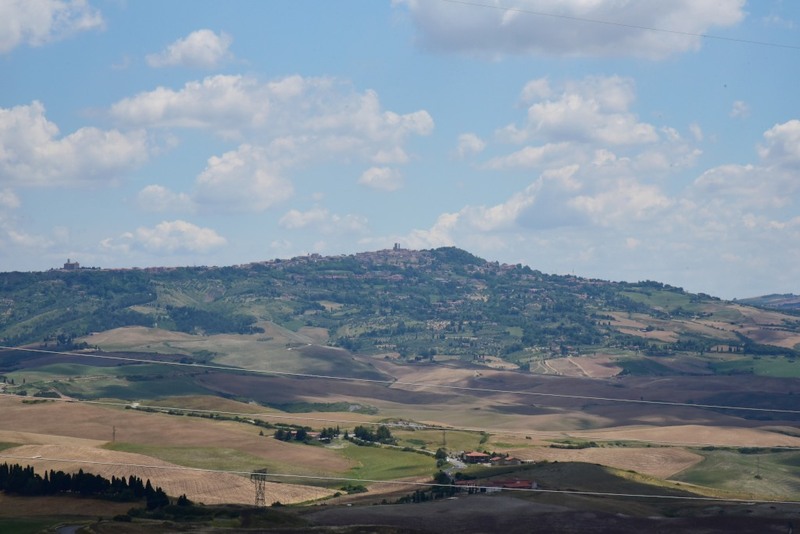 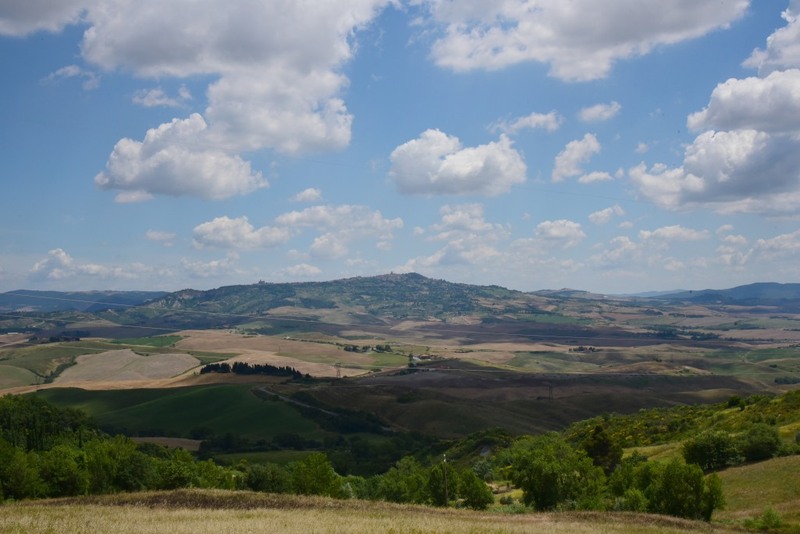 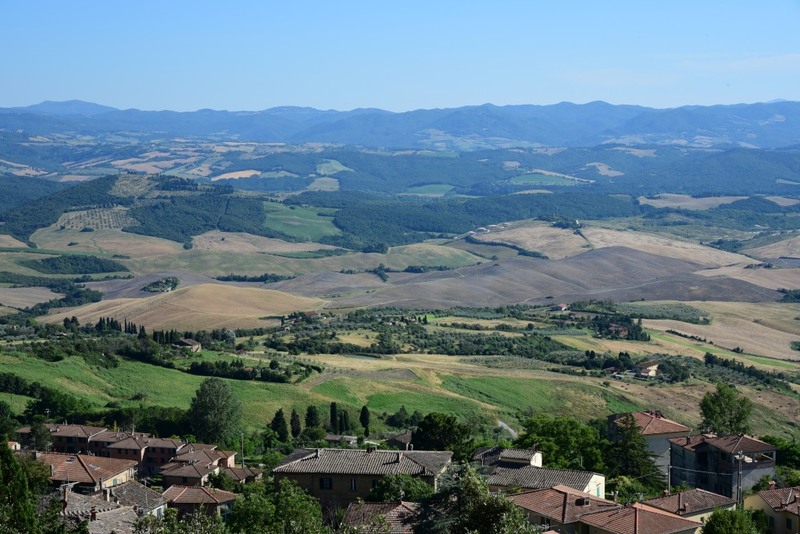 The object of the day is a visit to the ancient city of Volterra, set on a mountaintop on the far end of the rolling, barren Cecina valley. 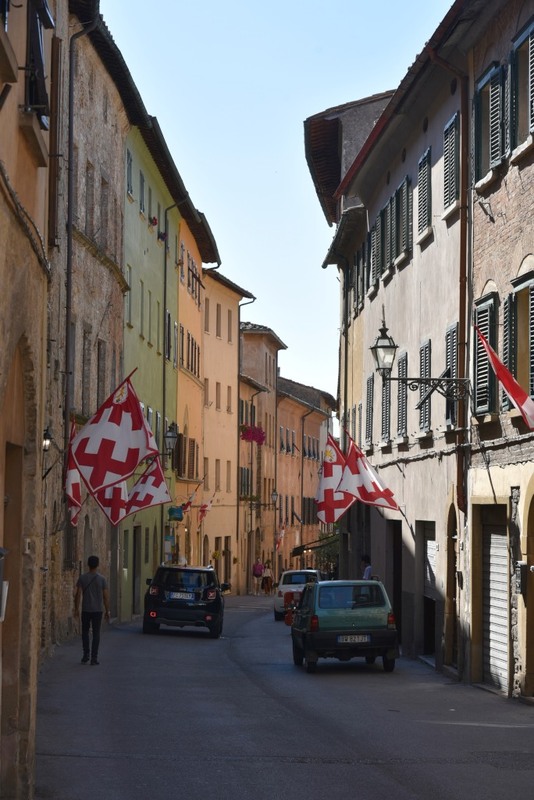 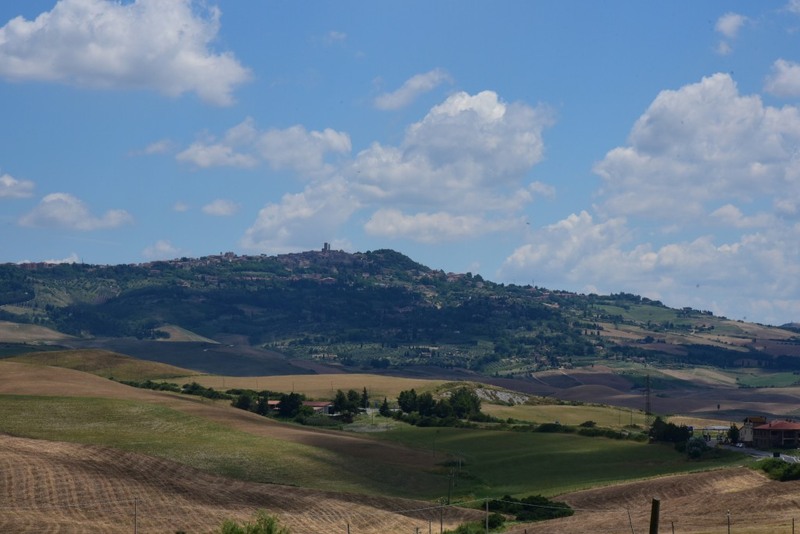 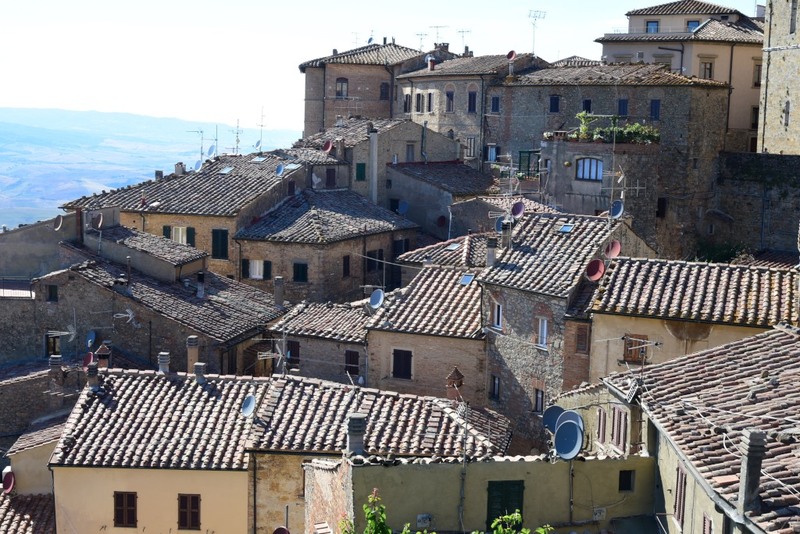 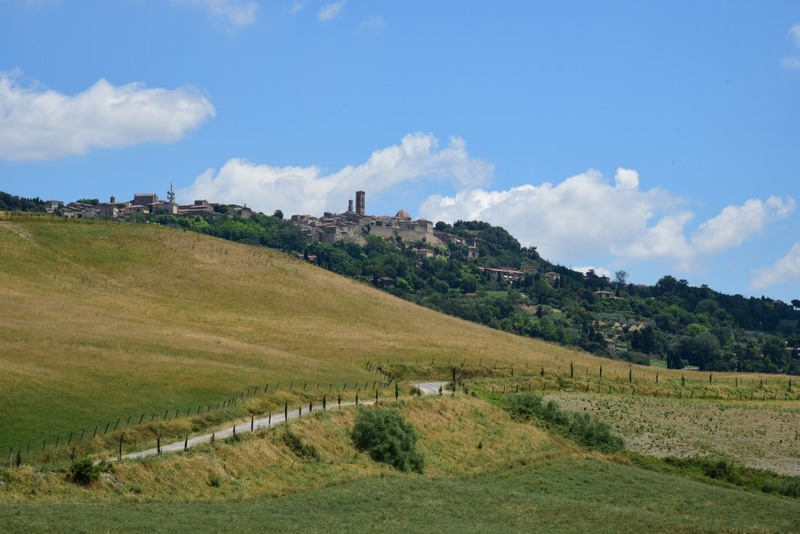 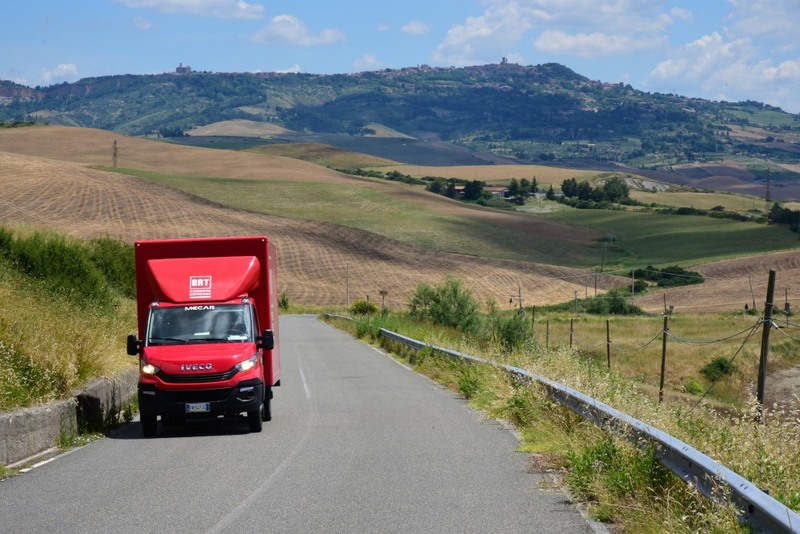 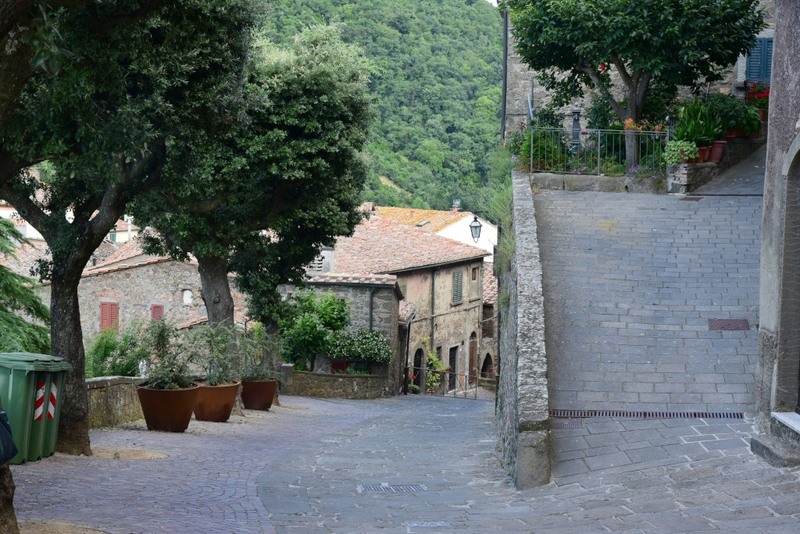 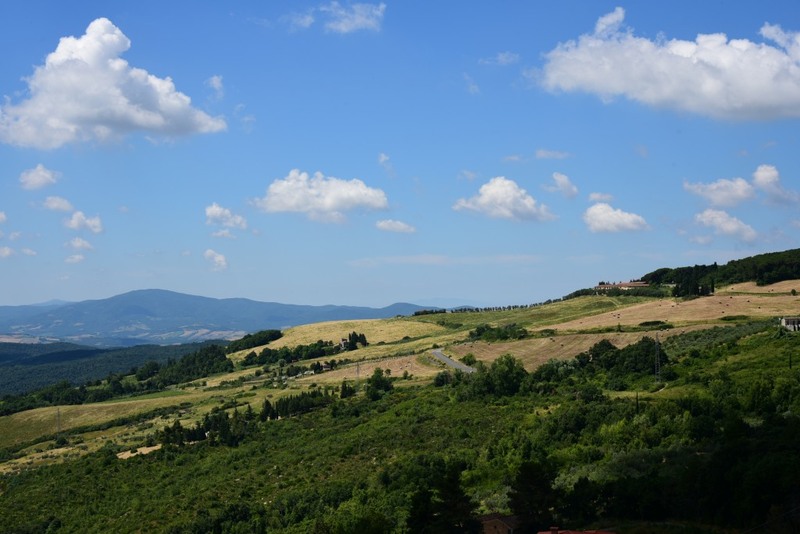 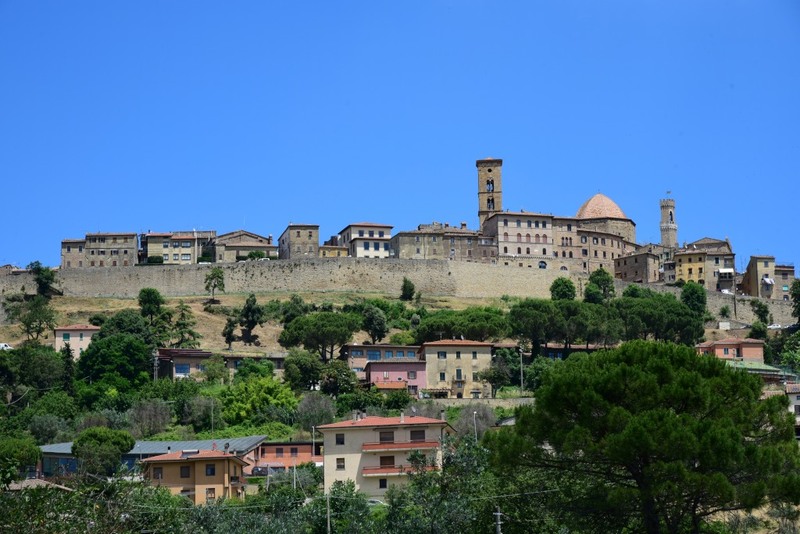 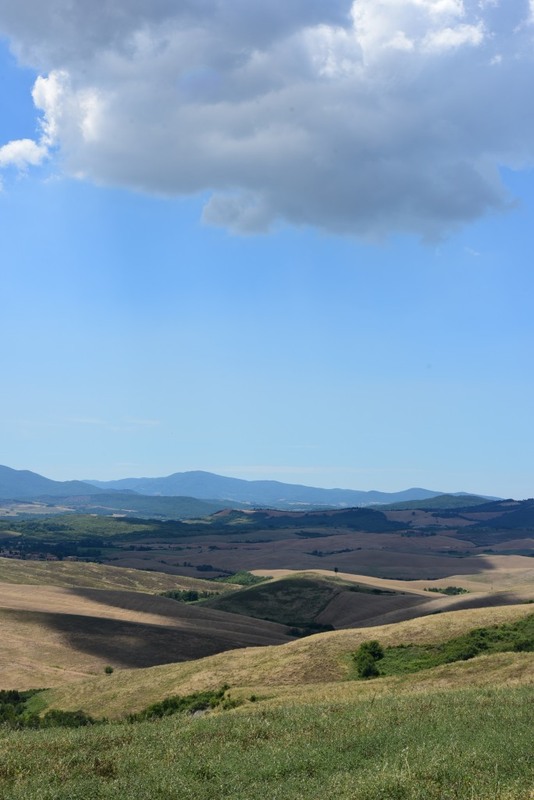 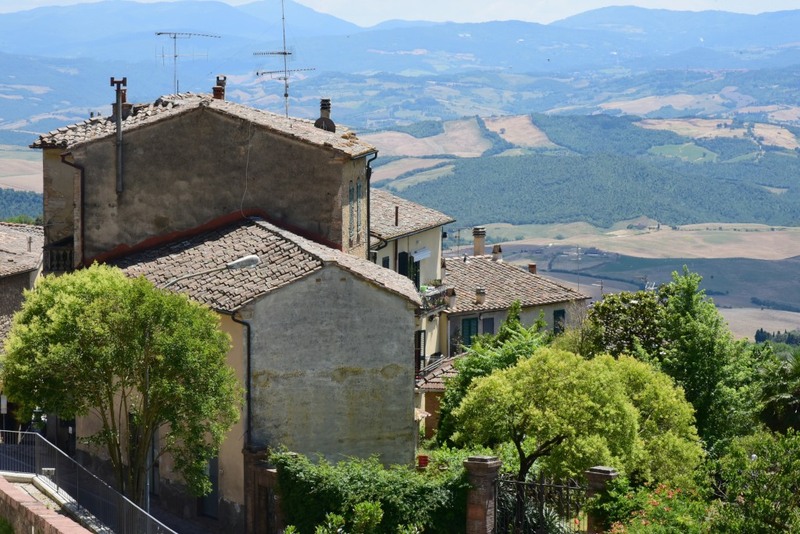 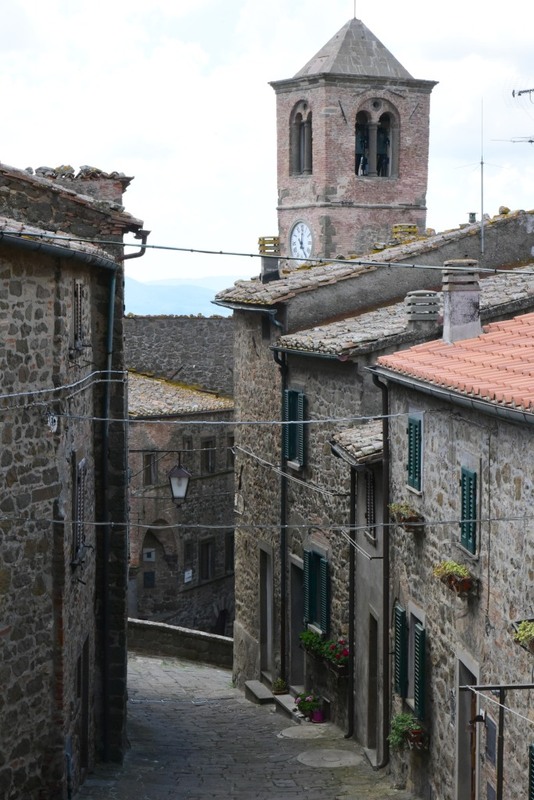 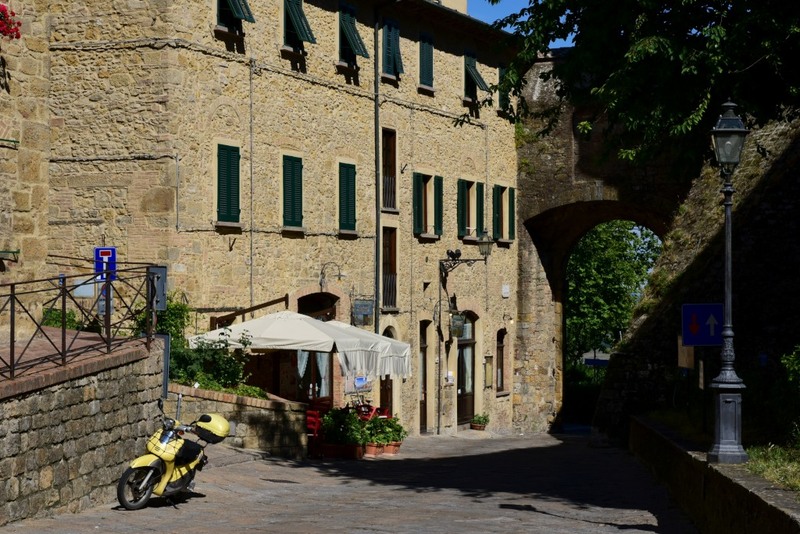 Volterra is a walled mountaintop town that dates to the Villanovan culture, later being settled by the Etruscans, and becoming one of the twelve cities of the Etruscan League. 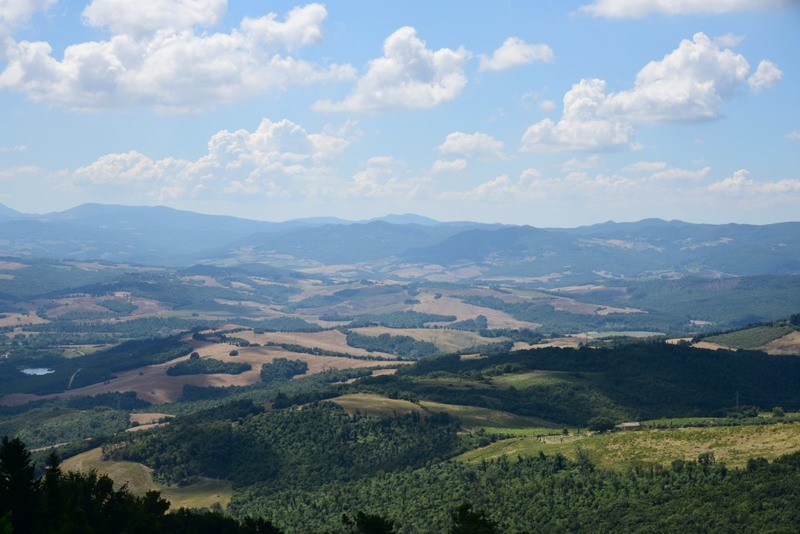 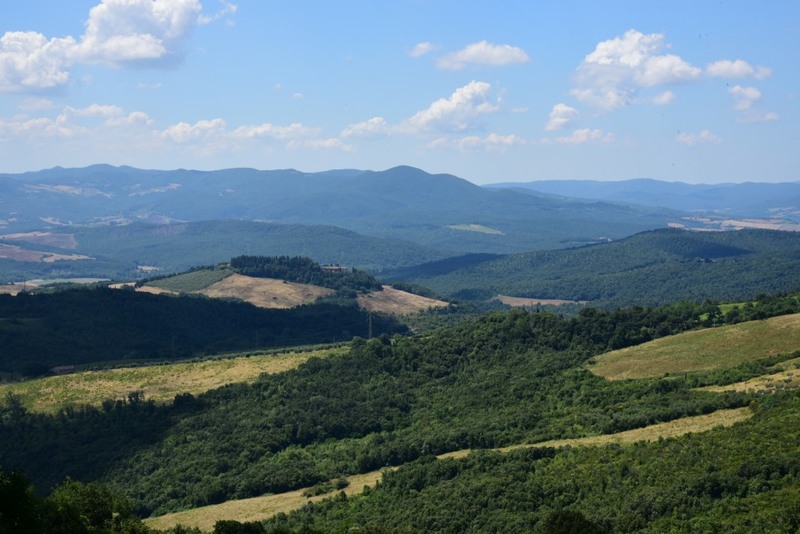 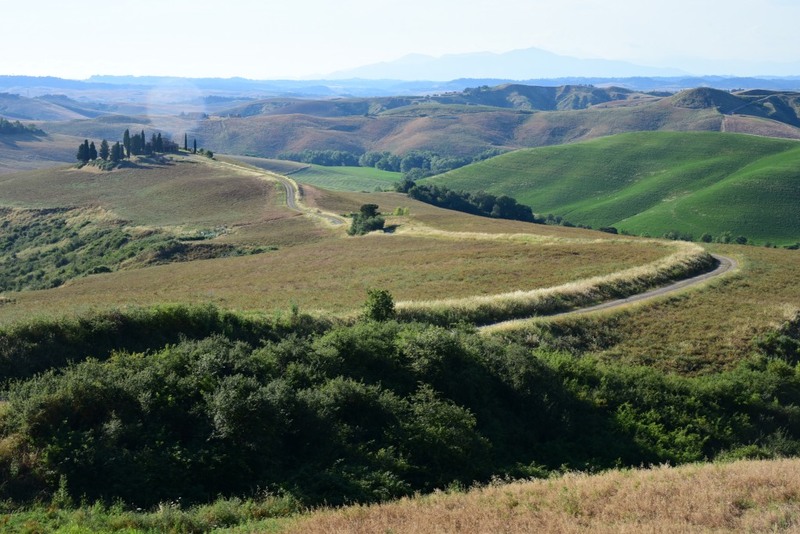 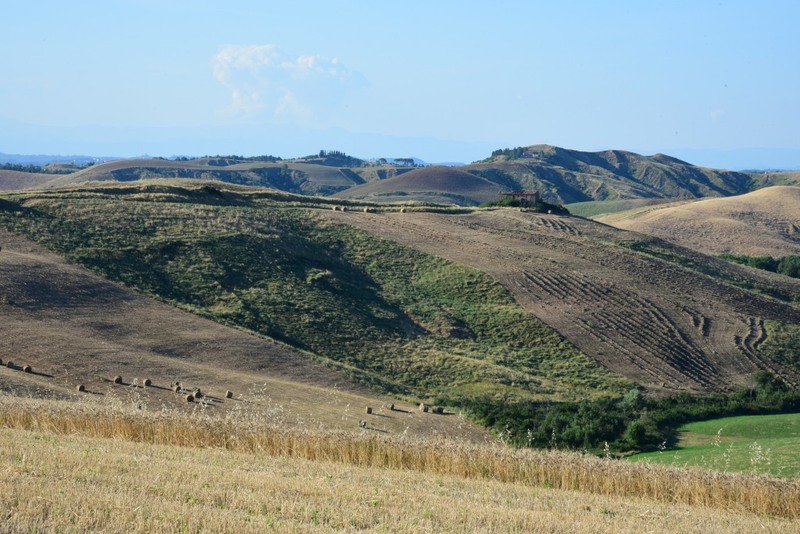 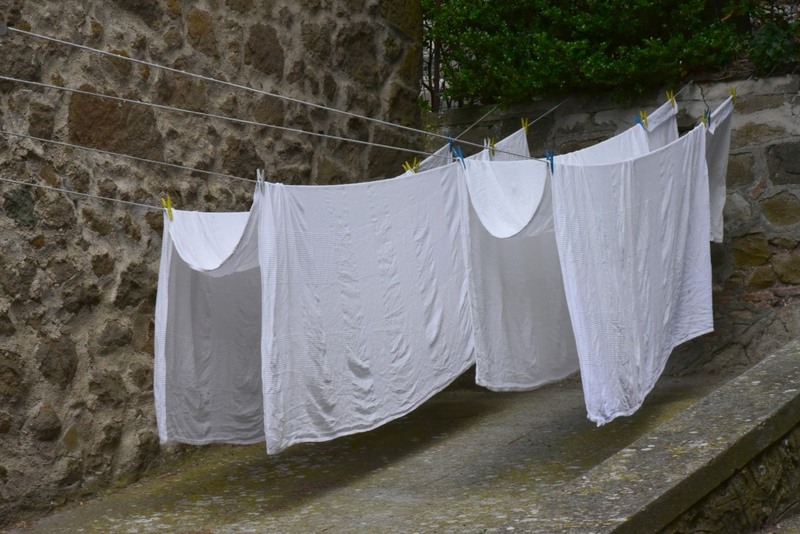 It was known to the ancient Etruscans as Velathri or Vlathri. 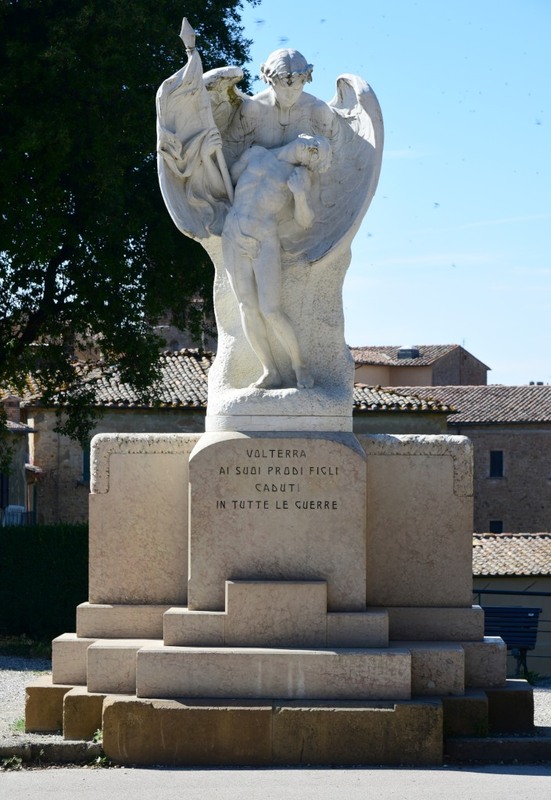 When the Romans conquered the town, it was renamed to Volaterrae. 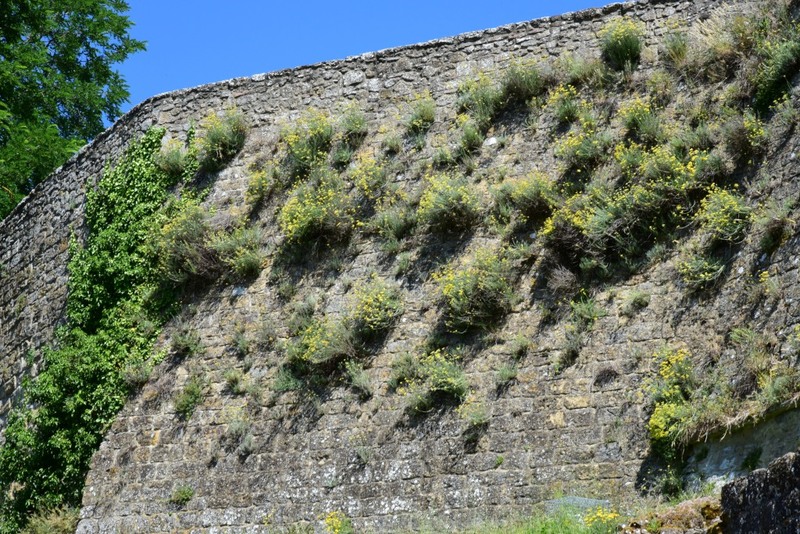 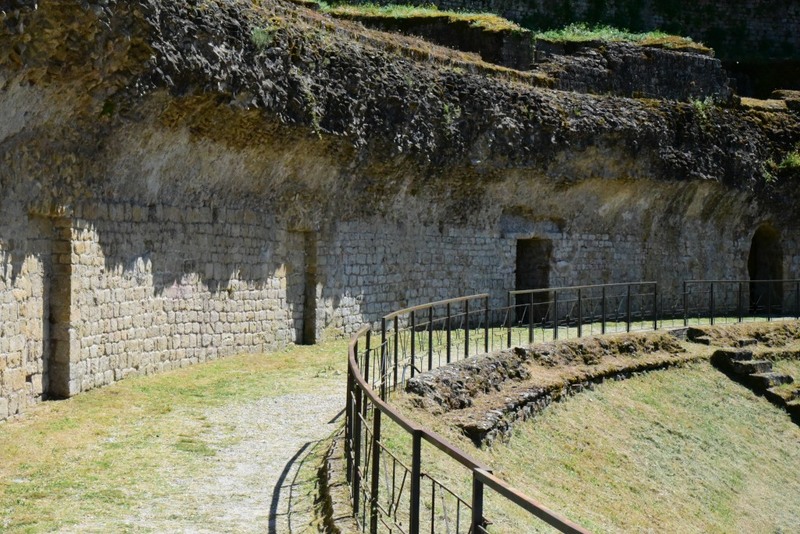 At the end of the 4th century B.C., fortification walls were built over seven km in length to protect the urban center, fountains, cultivated fields and pastures from foreign invasions. 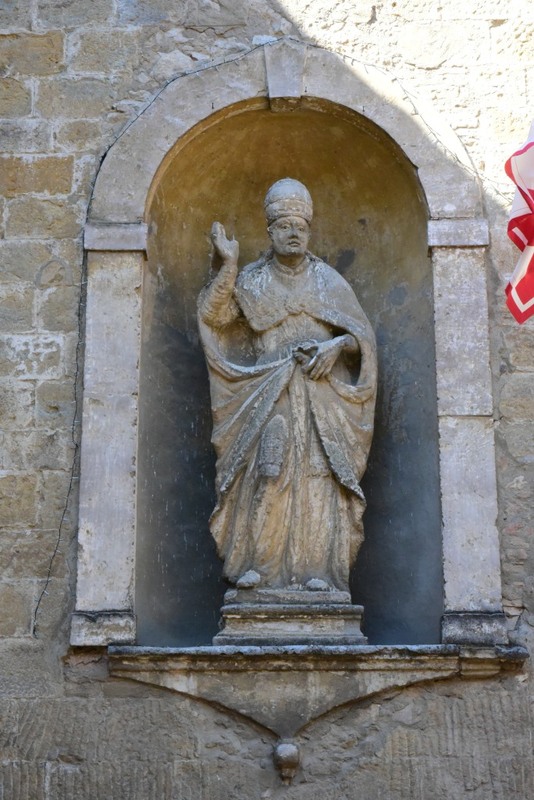 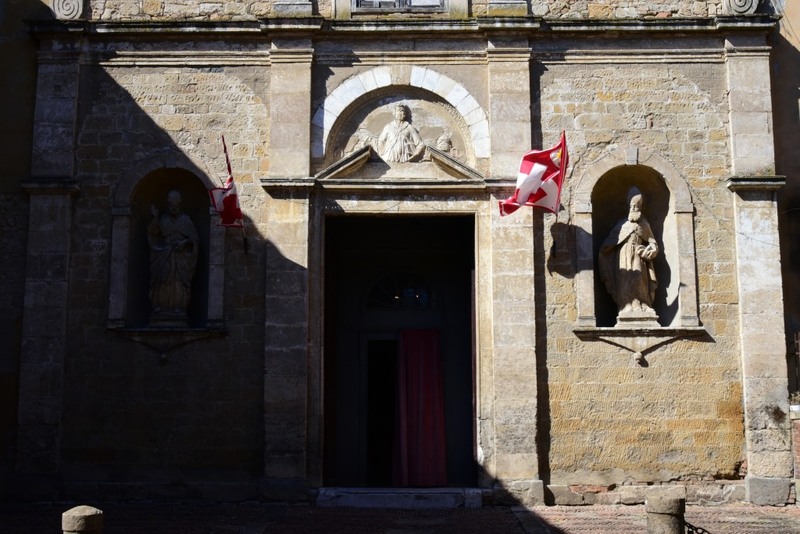 After the Frankish and Lombard dominions, Volterra passed under papal control, passed into the Grand Duchy of Tuscany before finally becoming part of the Kingdom of Italy in 1860. 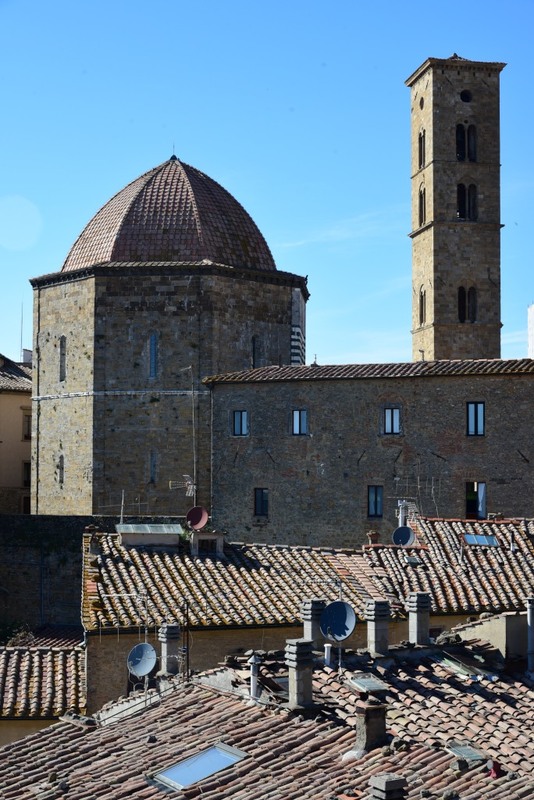 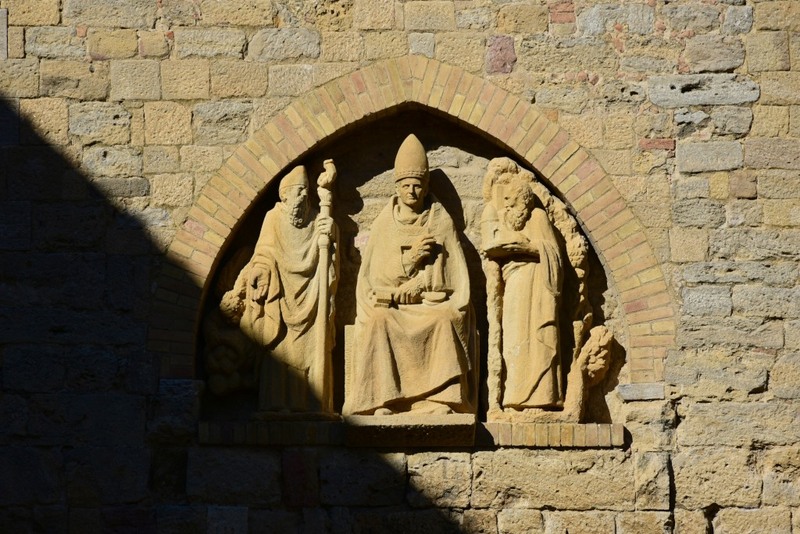 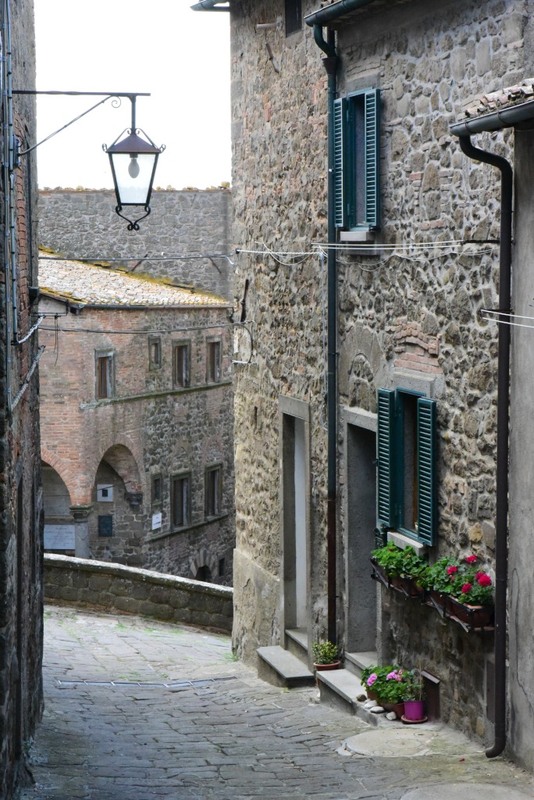 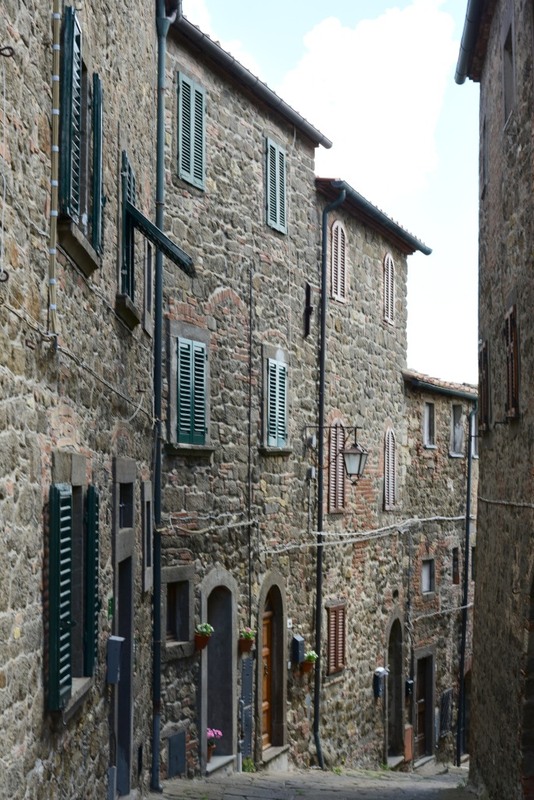 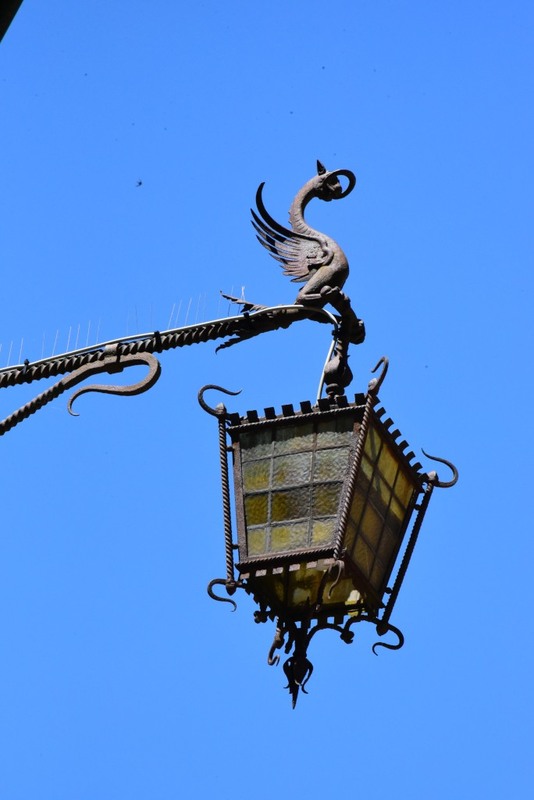 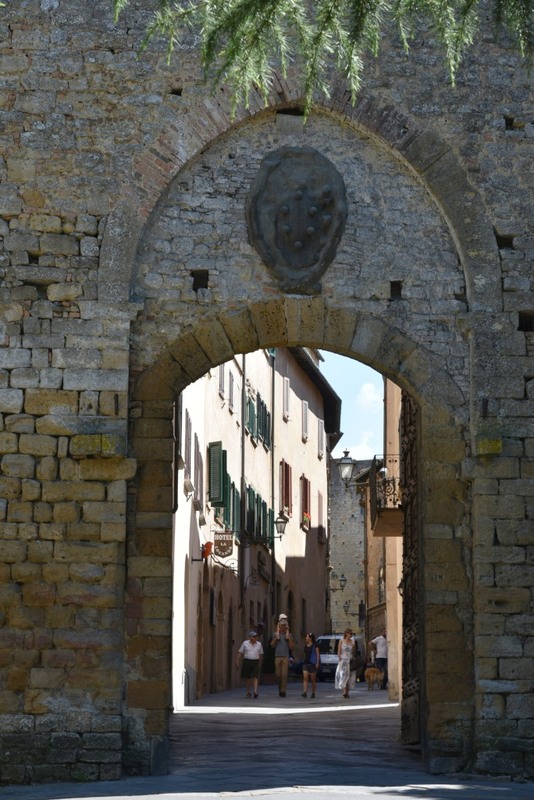 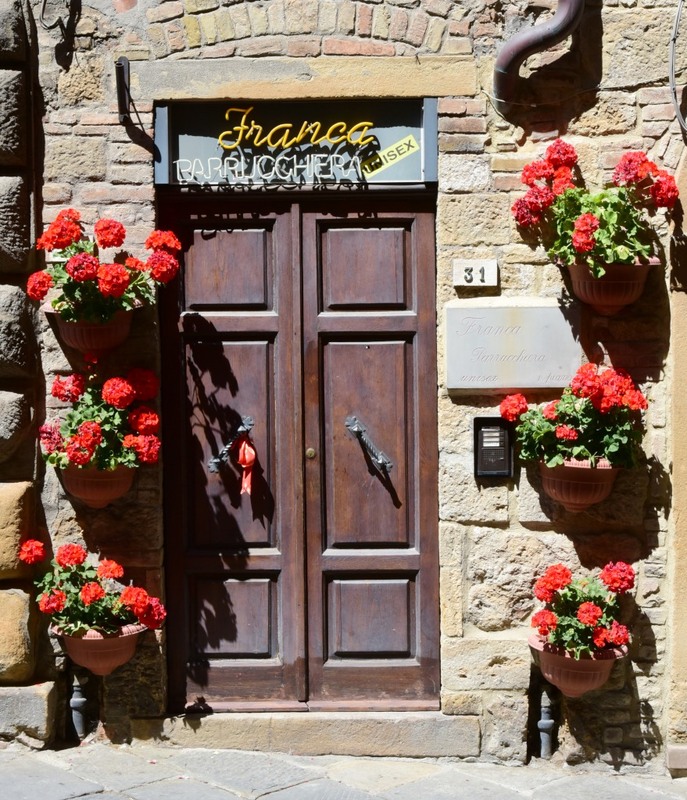 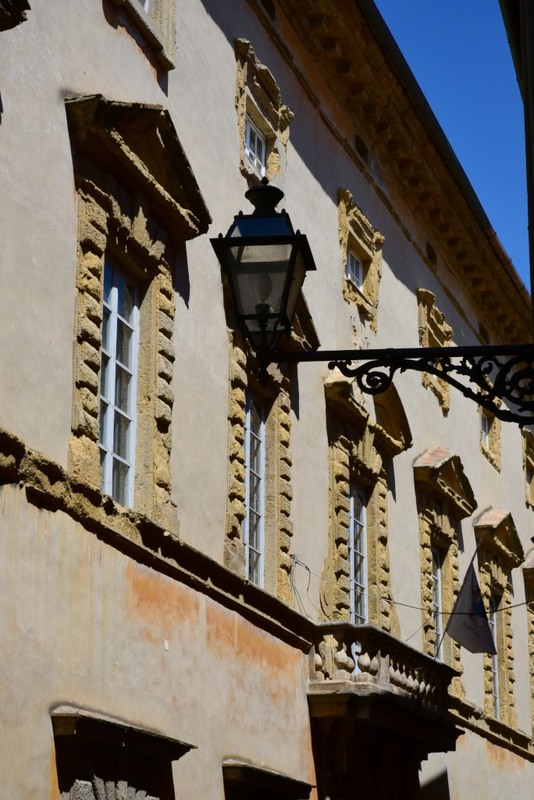 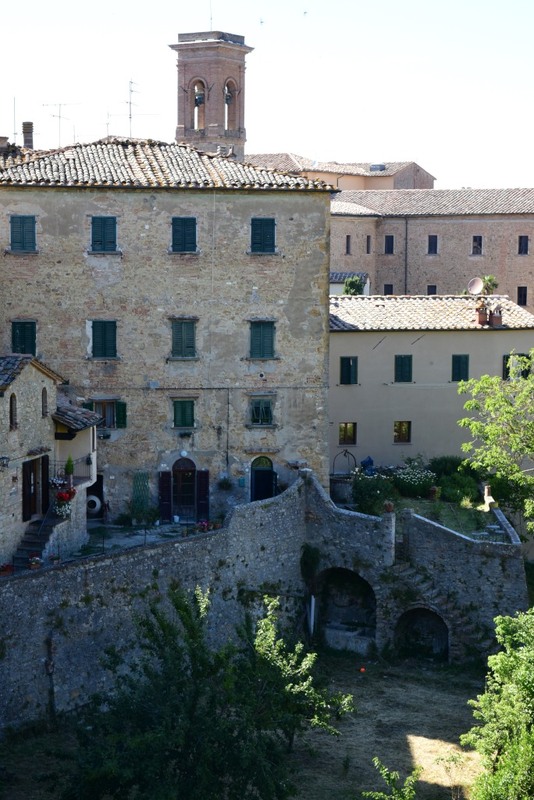 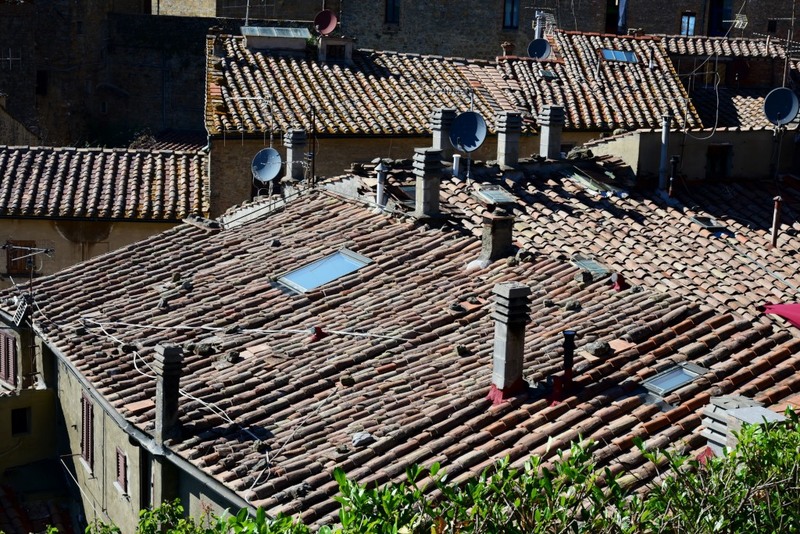 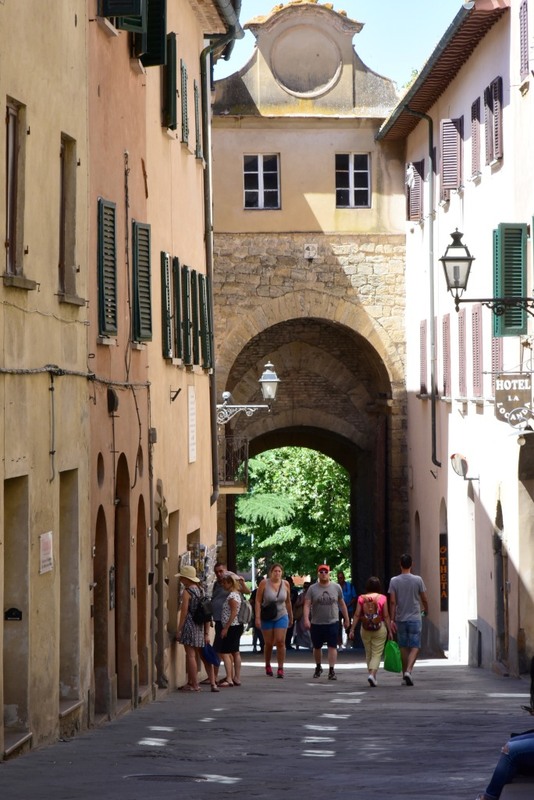 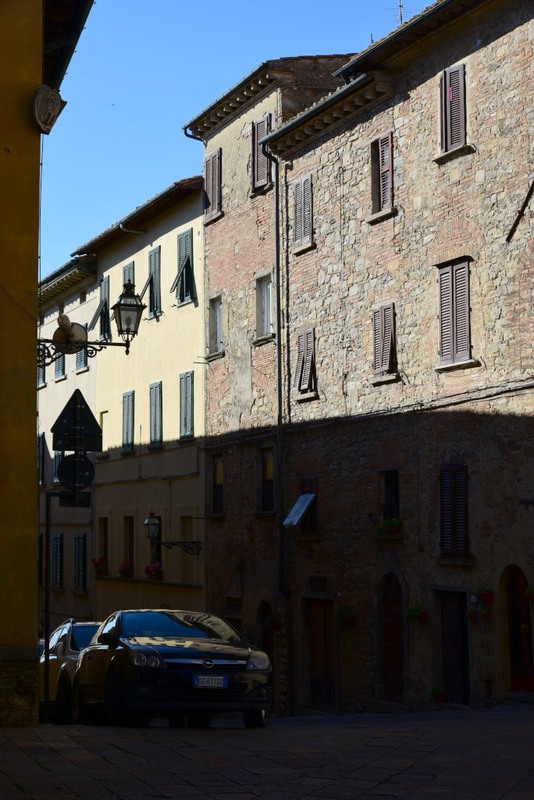 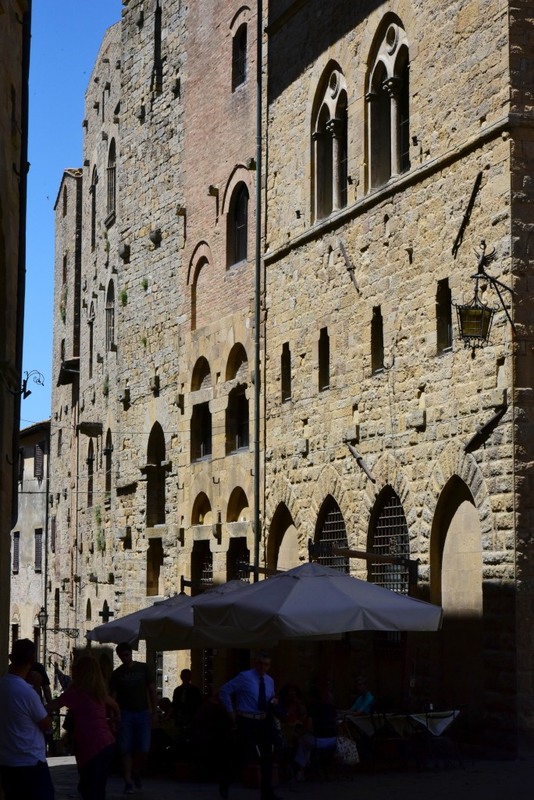 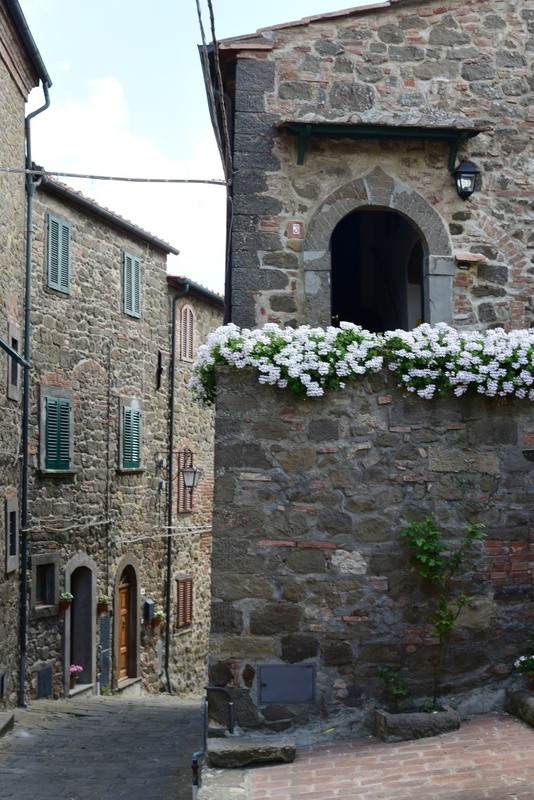 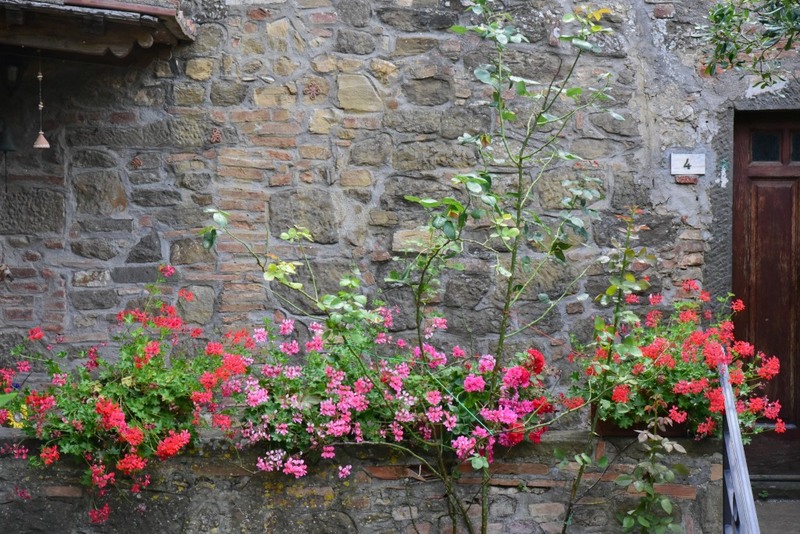 Volterra’s Piazza dei Priori is one of the most perfect medieval town squares in Italy. 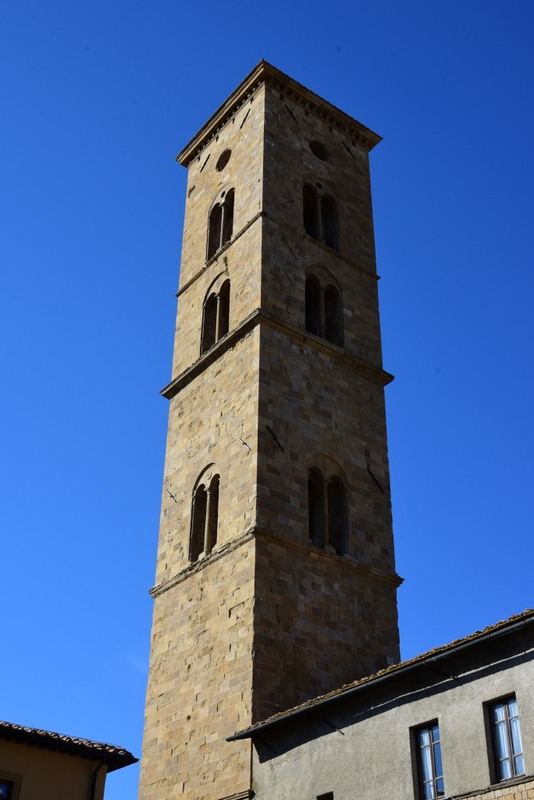 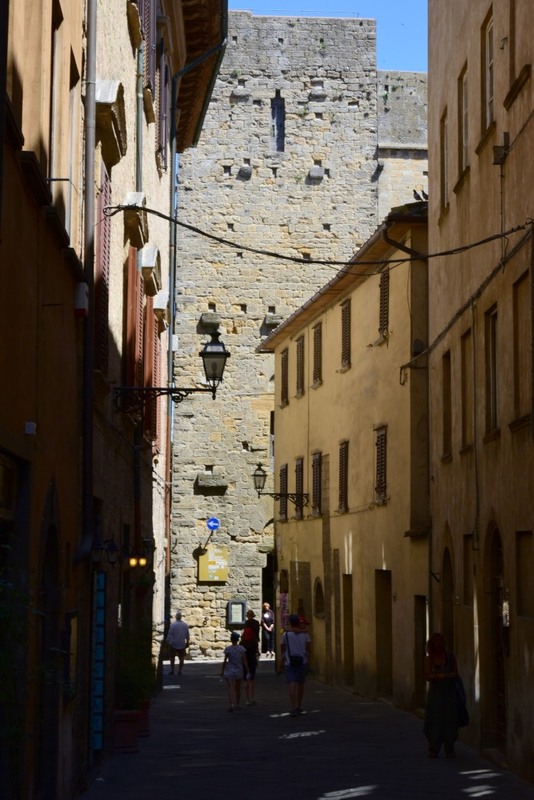 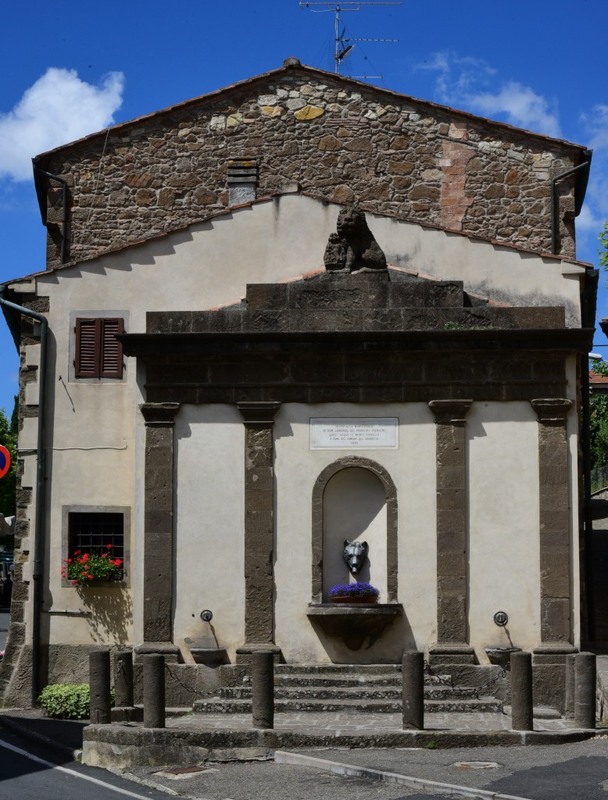 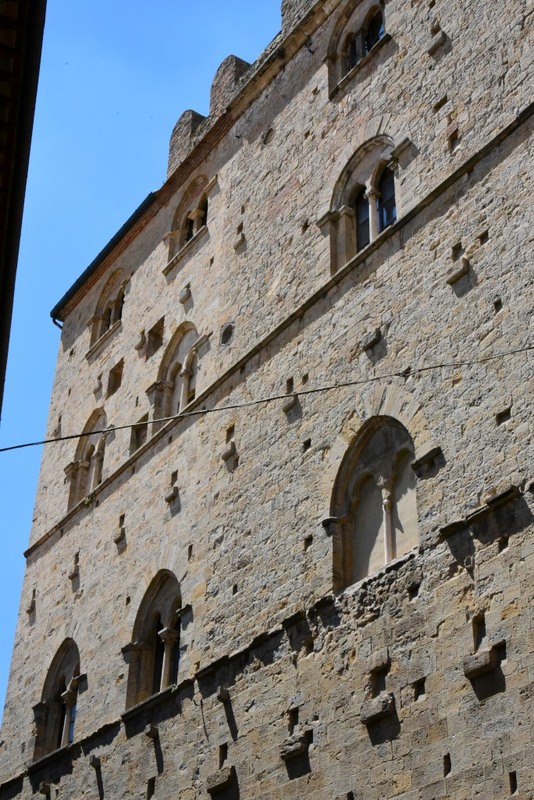 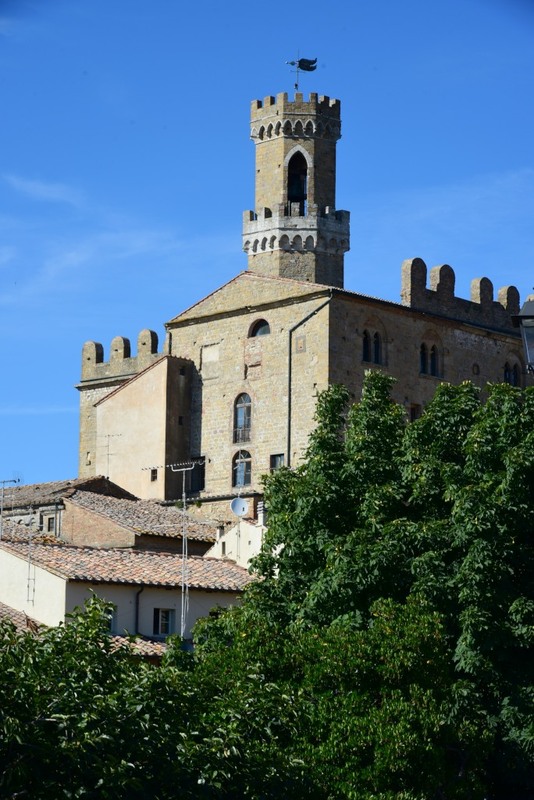 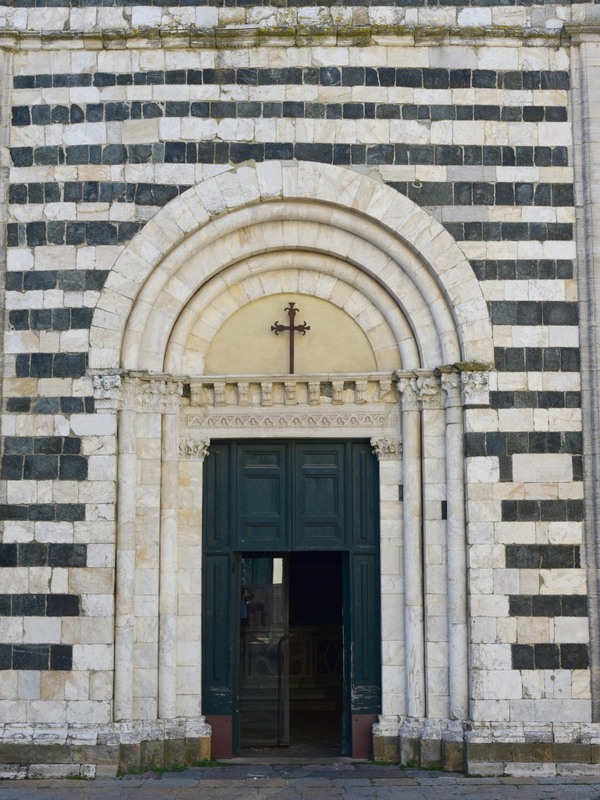 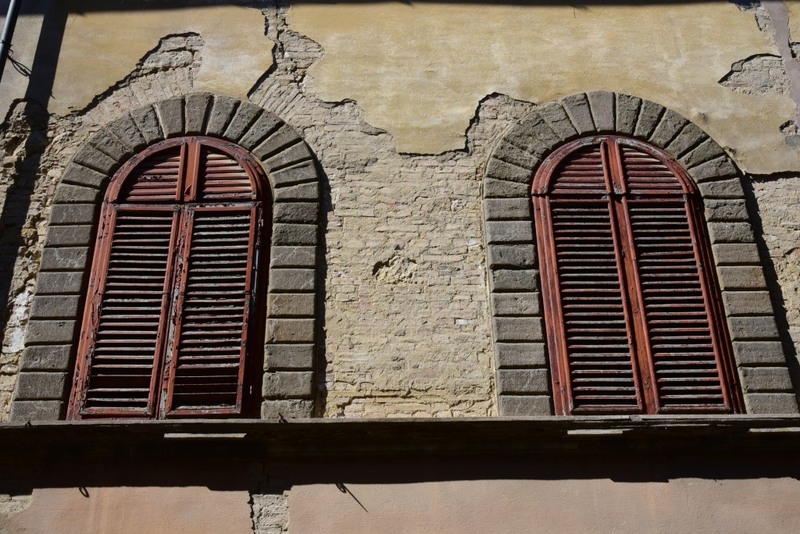 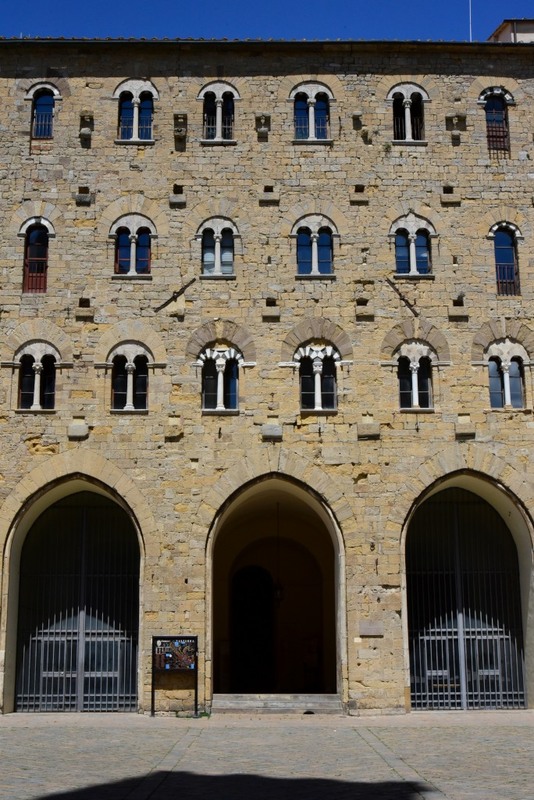 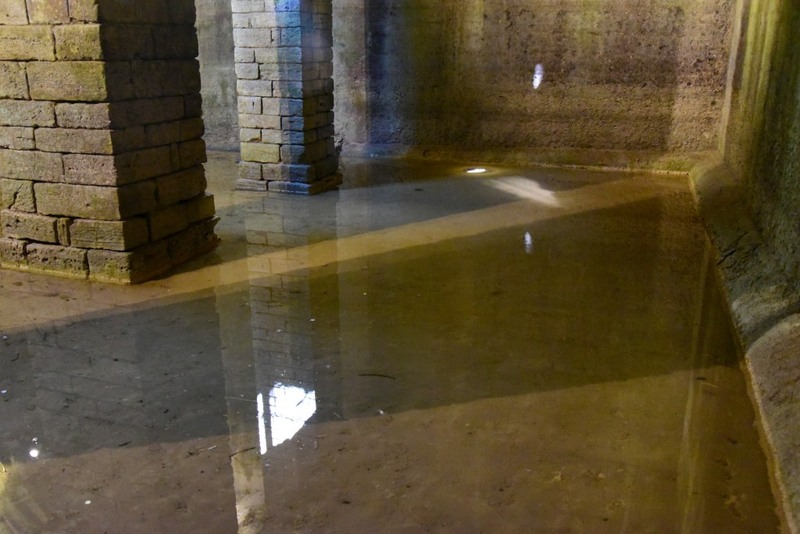 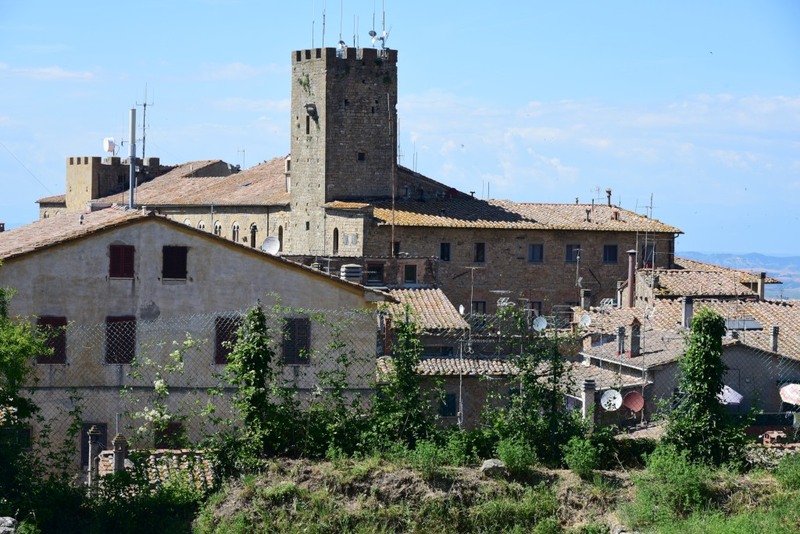 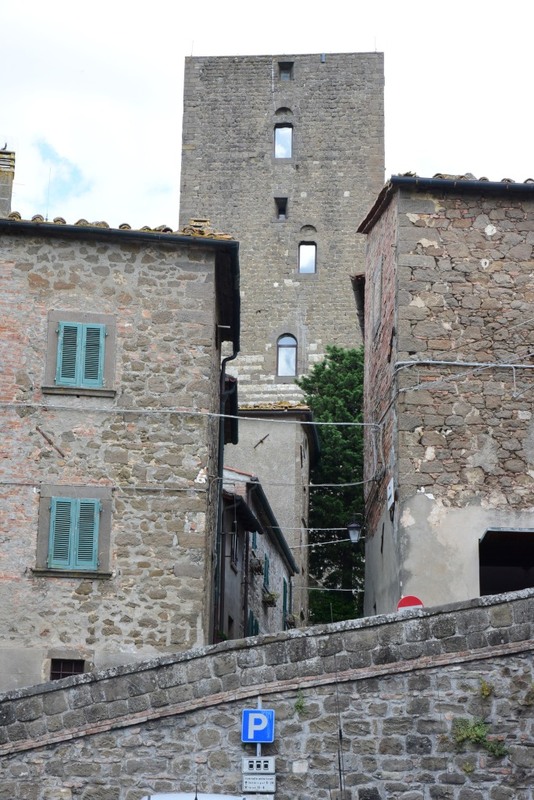 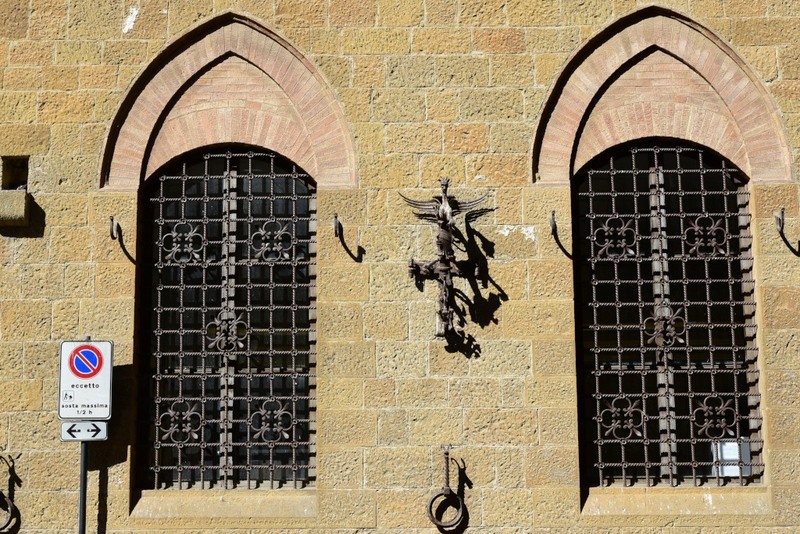 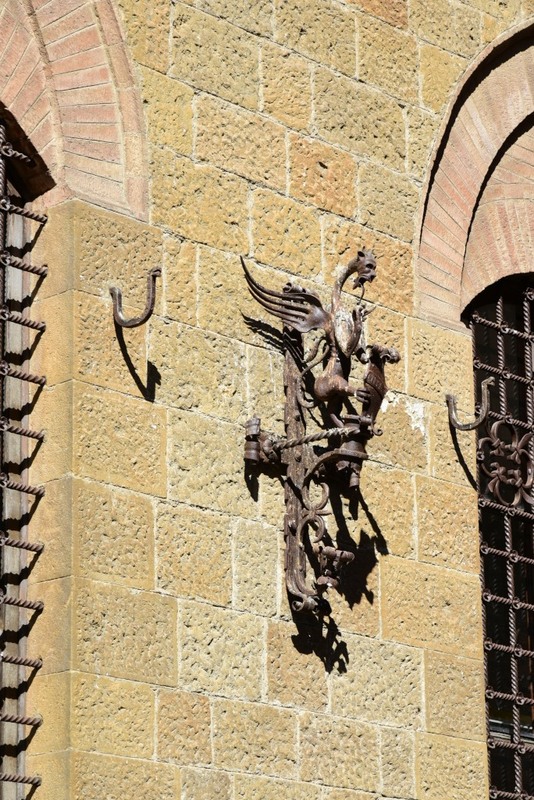 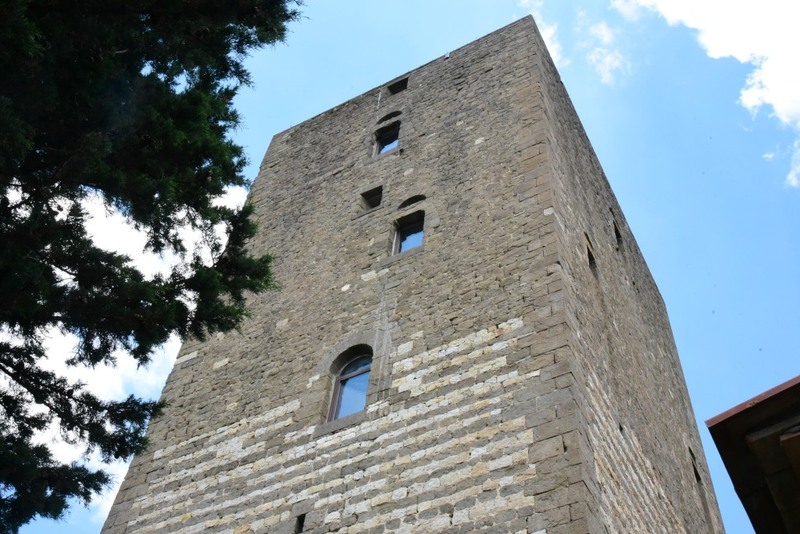 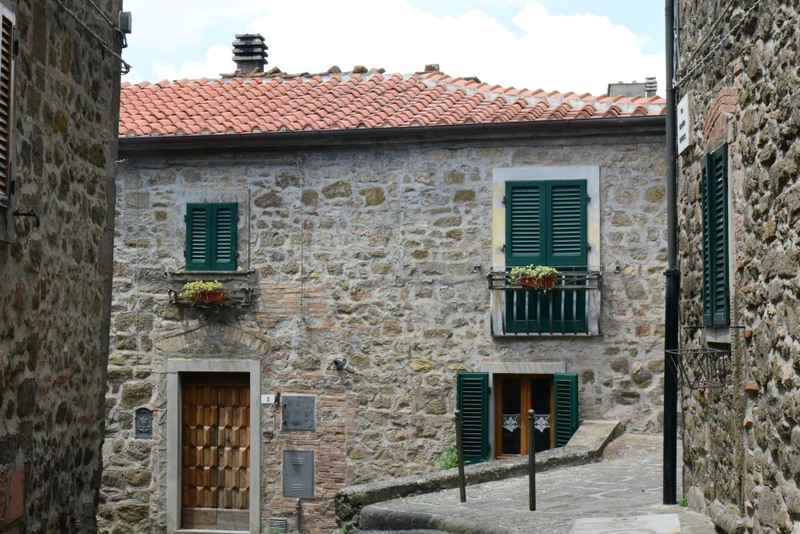 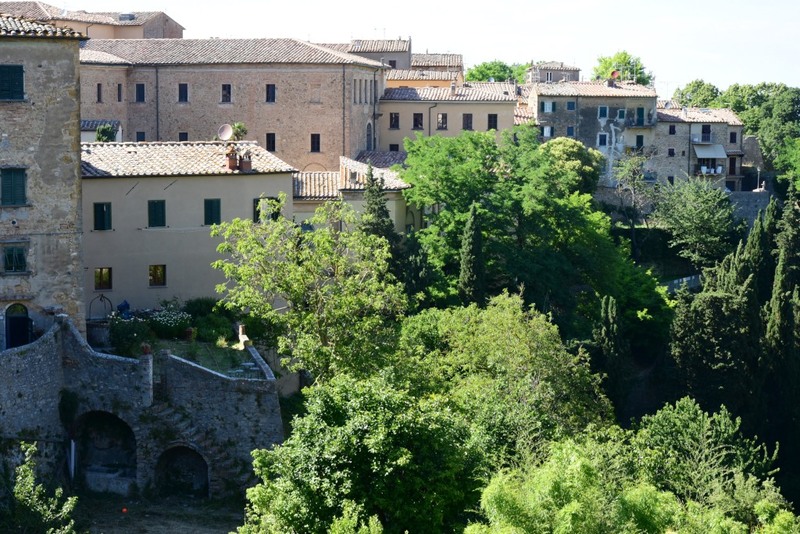 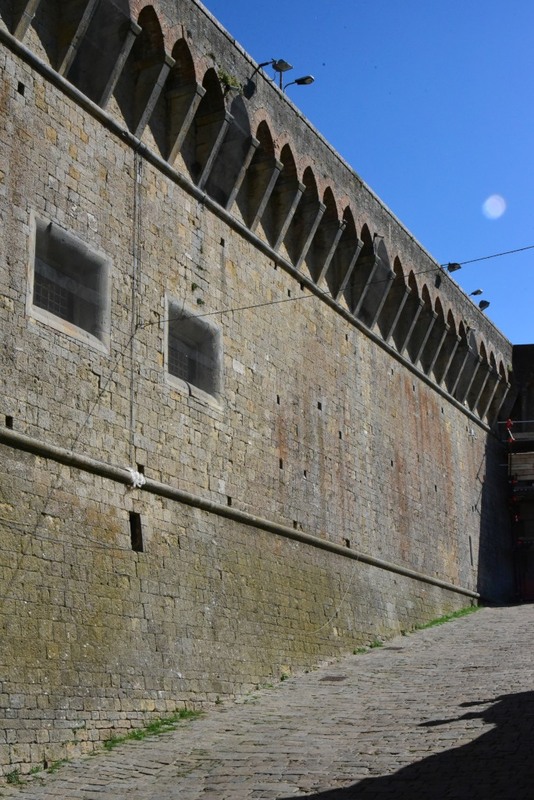 It is dominated by Palazzo dei Priori, the oldest town hall in Tuscany (1208-1254) as well as the Palazzo Pretorio, whose central tower was built in 1224. 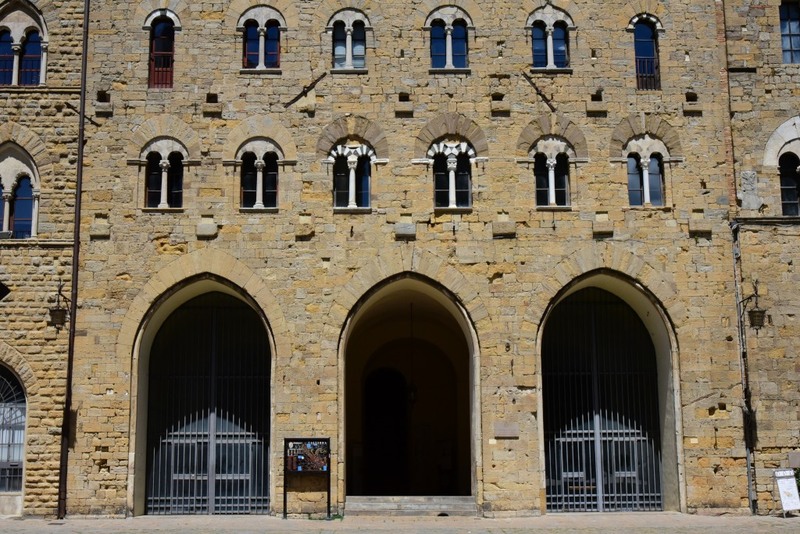 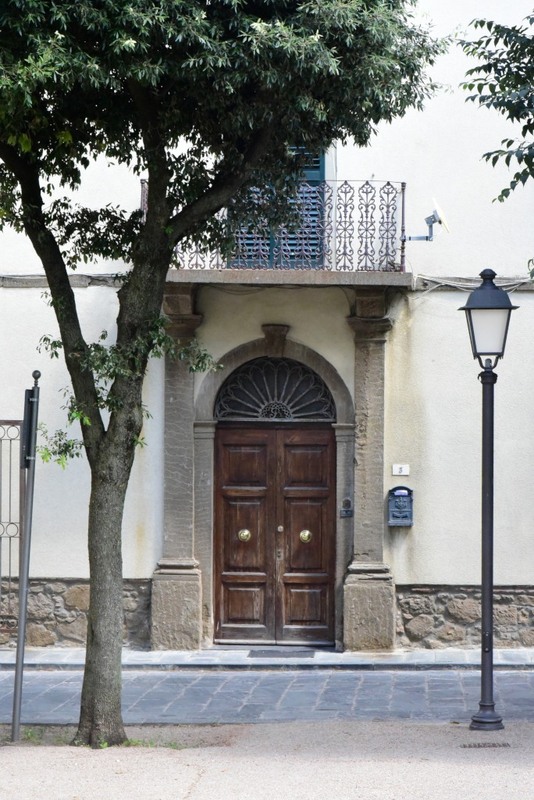 The other sides of the square are occupied by the heavily remodeled Cassa di Risparmio building, the 14th-century Palazzo Vescovile, and the rear of the cathedral. 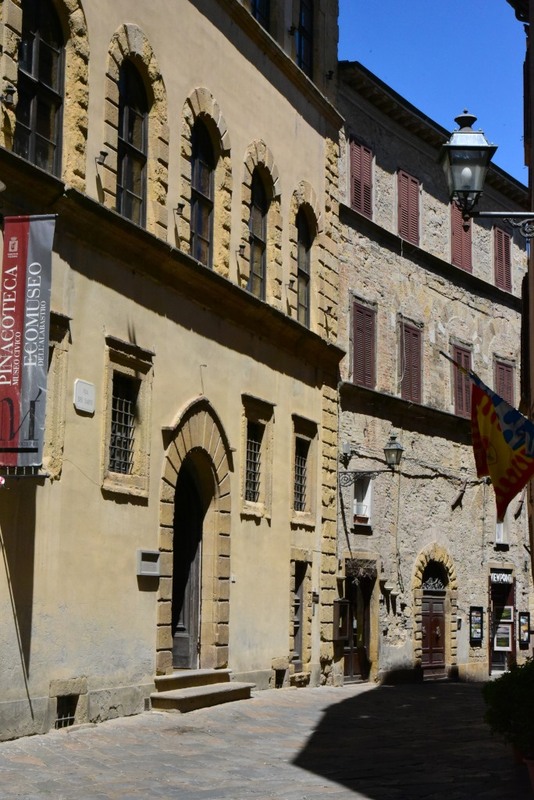 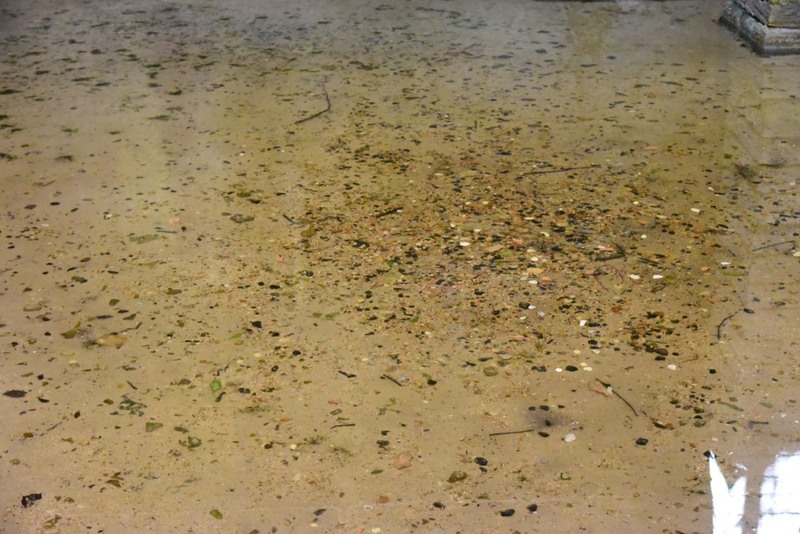 Much of the history enacted in this seemigly noble historic site was in reality of a much darker nature, the bloody invasion of the Florentines described in depth by Machiavelli. 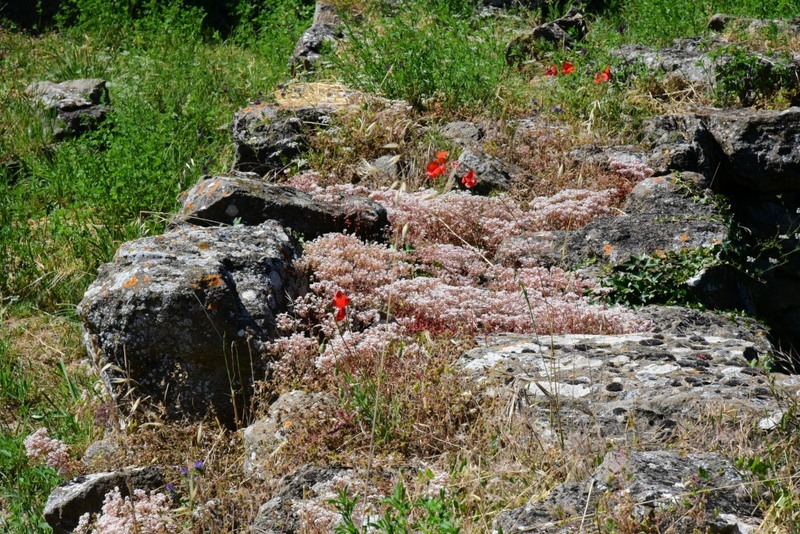 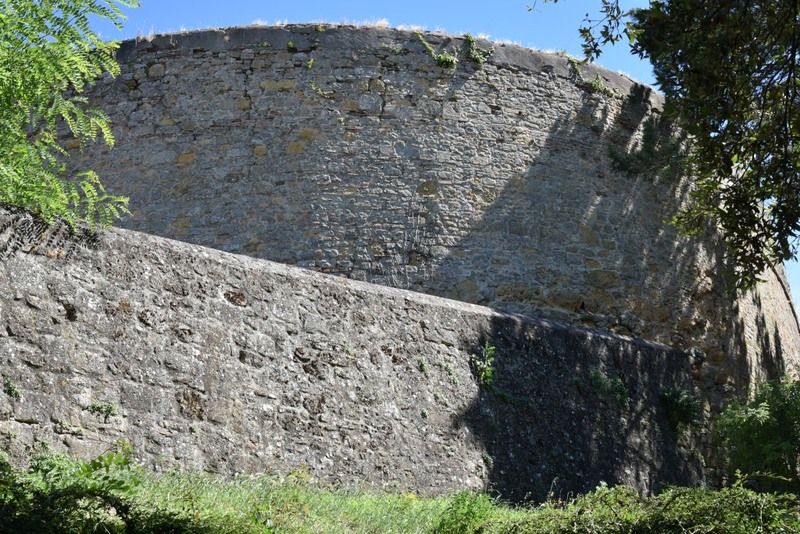 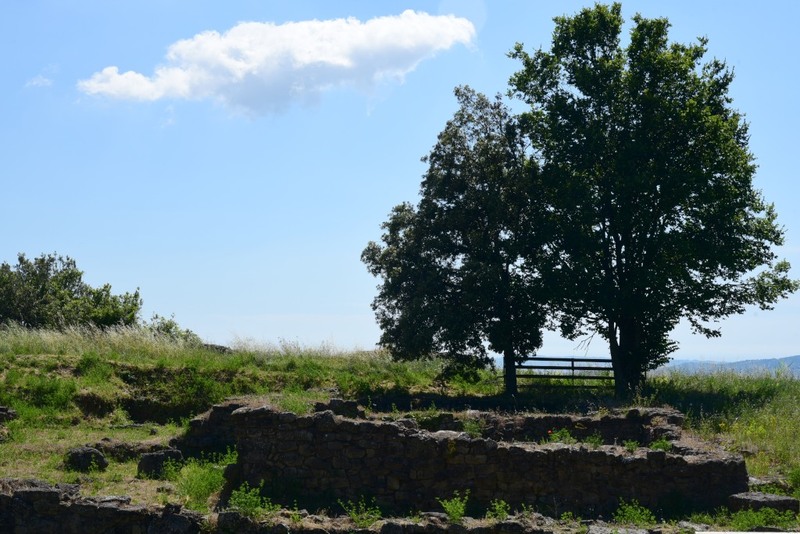 A portion of the majestic Etruscan protective walls dating from the 5th to 4th centuries B.C. 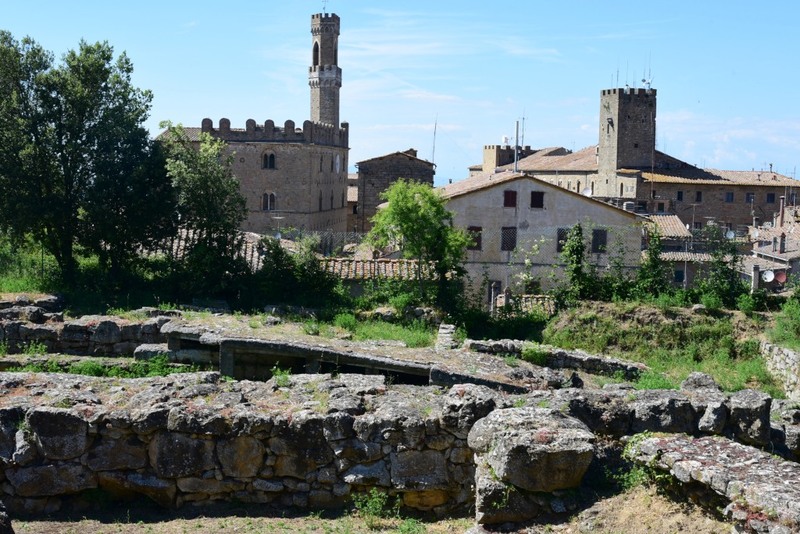 are still intact, including the well-preserved Porta dell’Arco and Porta Diana, two gates for entering the city, as well as the Acropolis that houses several buildings and the foundations of two ancient temples. 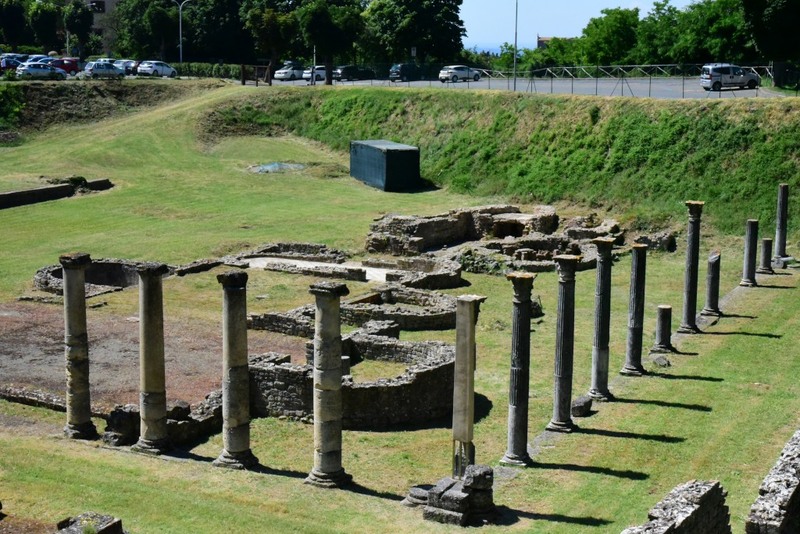 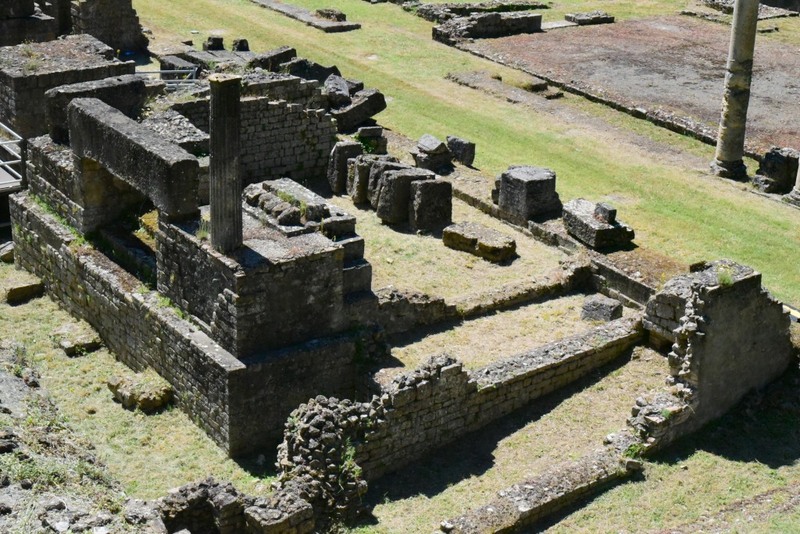 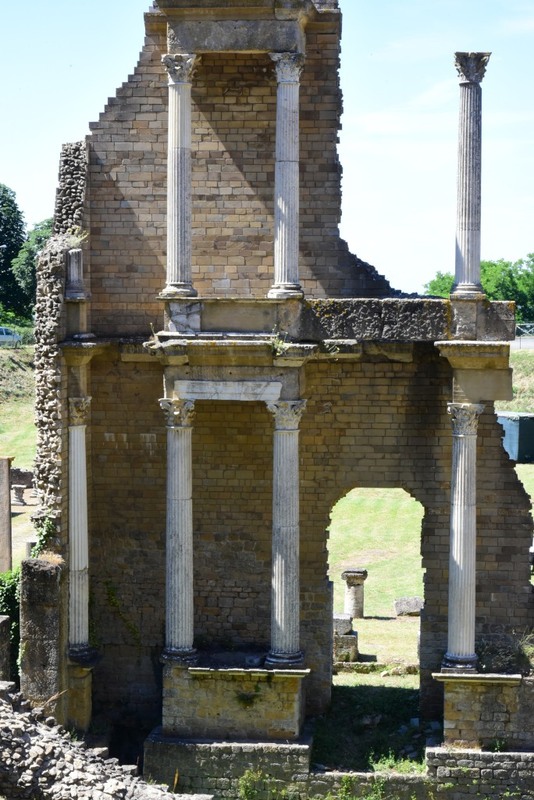 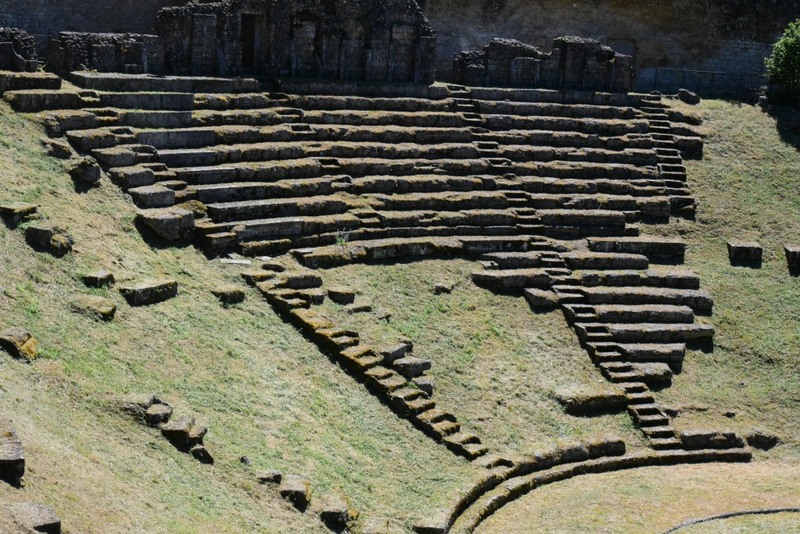 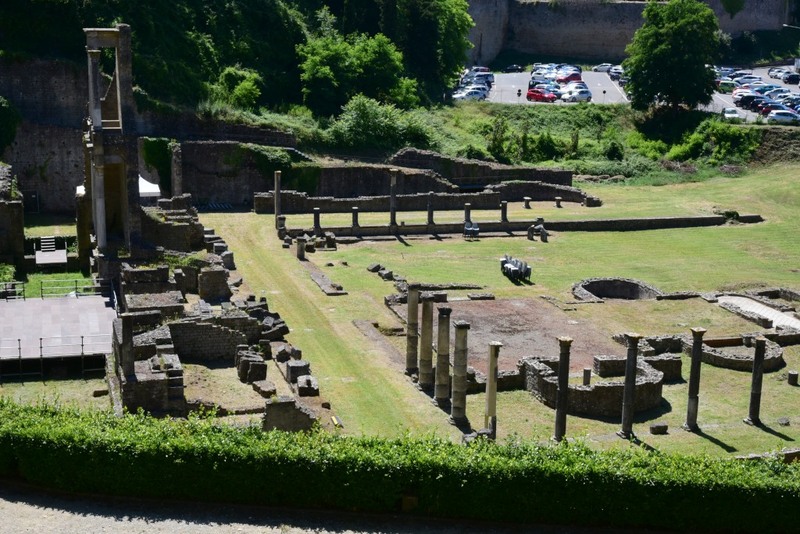 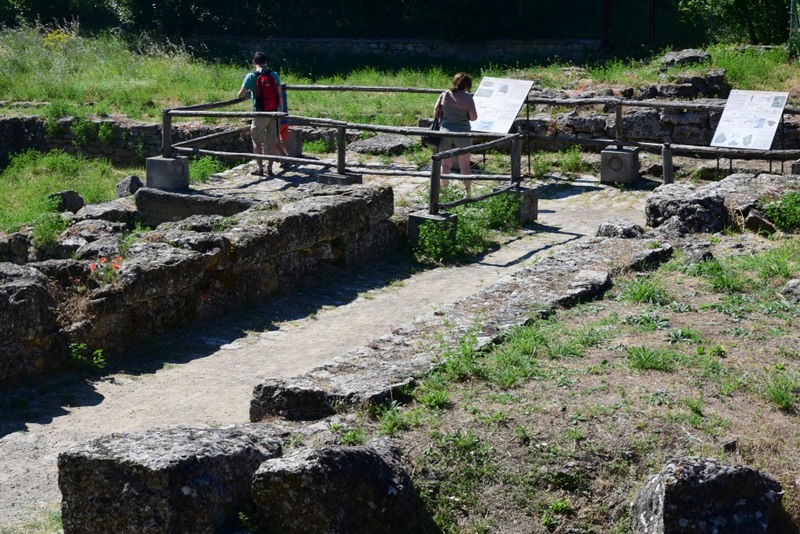 Remains from ancient Roman times include the amphitheater, dating to the end of the first century A.D. 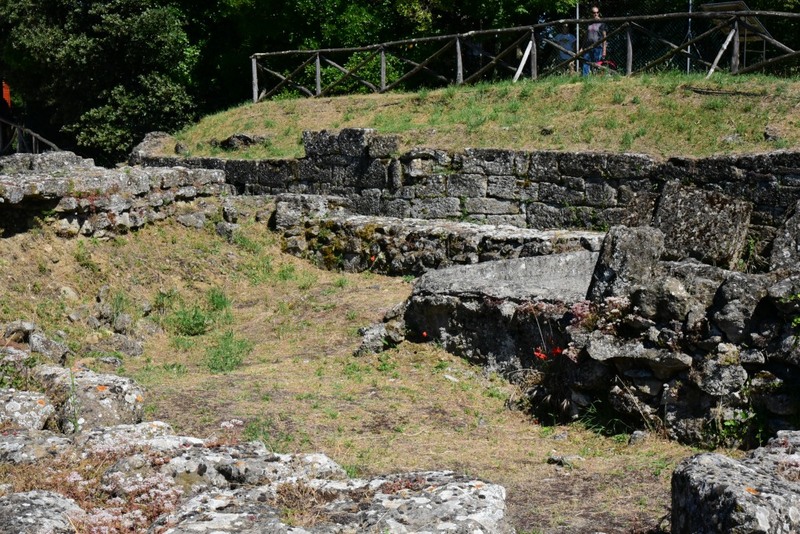 The Etruscan walls mark the perimeter of the “Parco Archeologico Enrico Fiumi,” a garden that occupies the highest spot in town, where the remains of two Etruscan temples can be found, as well as a fascinating 1st-century basin that the Romans built to collect rain water and distribute it to citizens who lived in lower-lying areas. 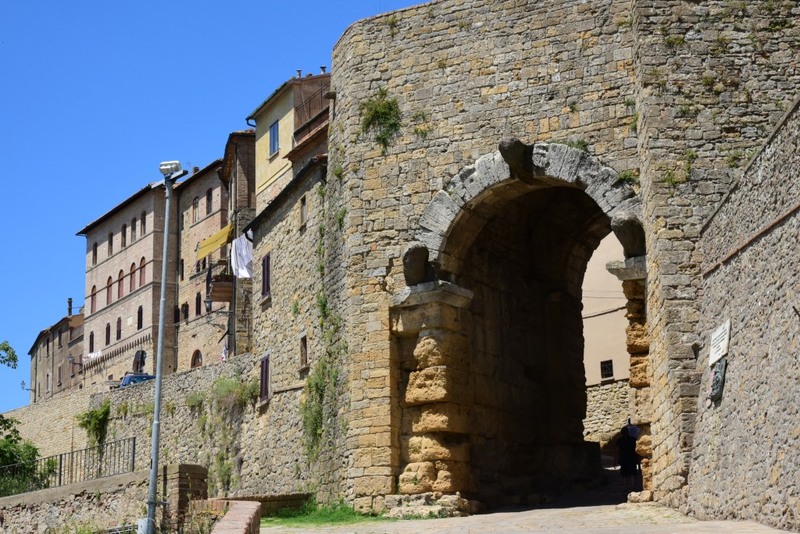 On one end of the Parco Archeologico is the old Etruscan gate to the city, next to a fortress built by Lorenzo the Magnificent when Florence occupied Volterra between 1472 and 1475. 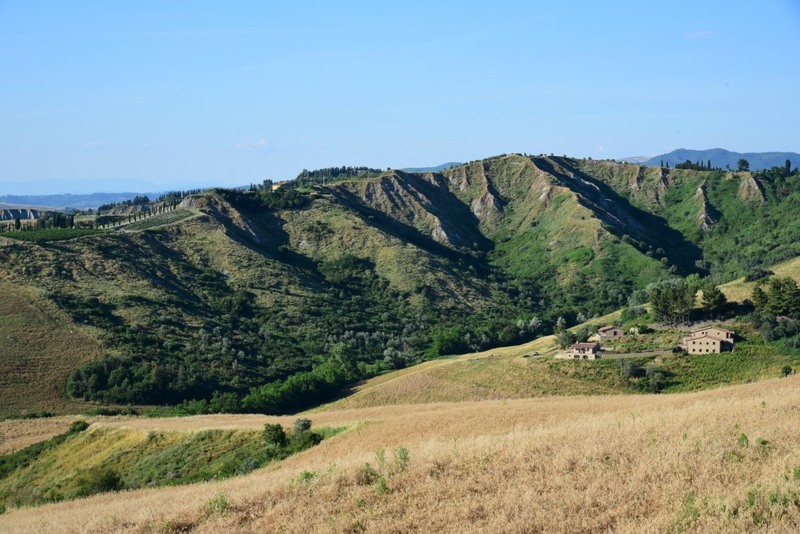 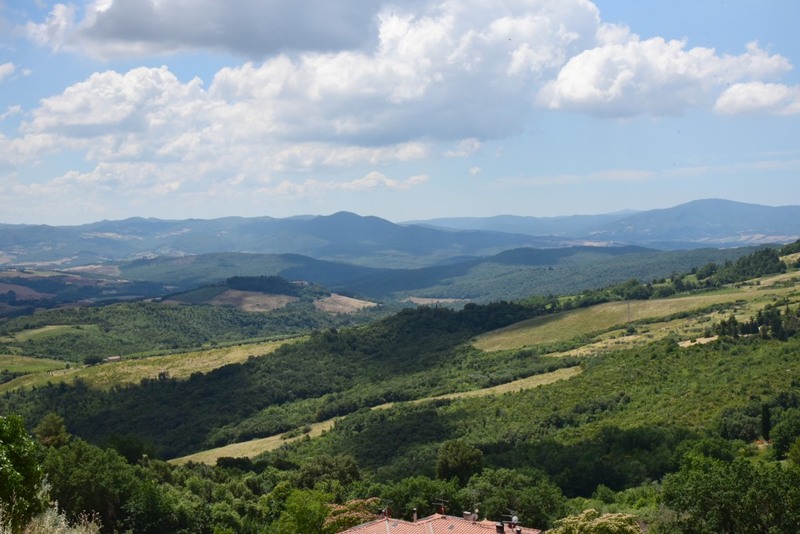 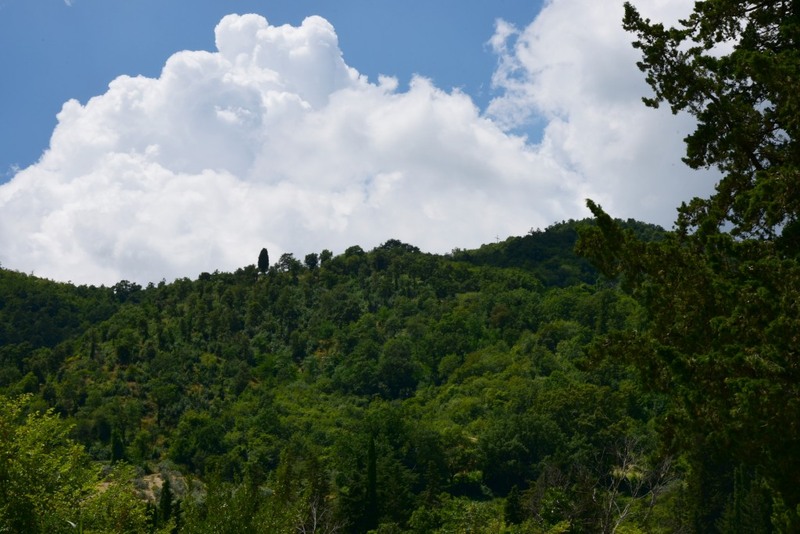 On the other end of the park is Piazza Martiri della Libertà, offering excellent views of the Cecina Valley below, and on clear days, the Tyrhennian Sea. 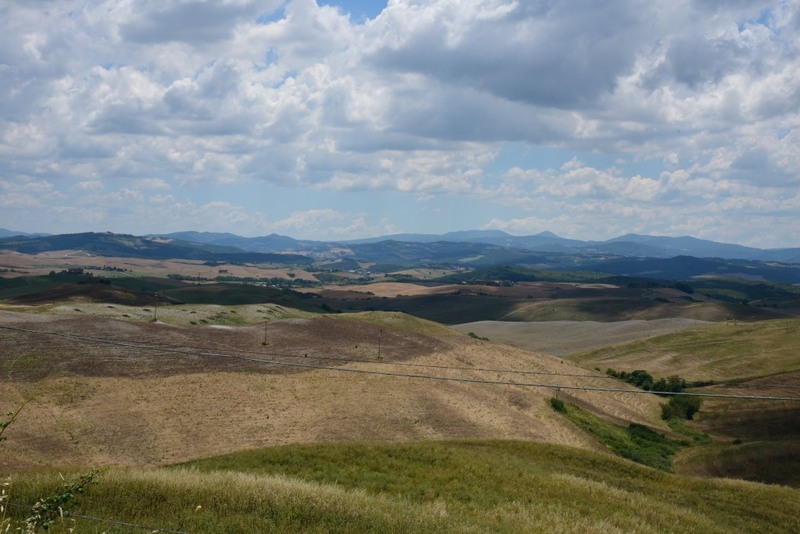 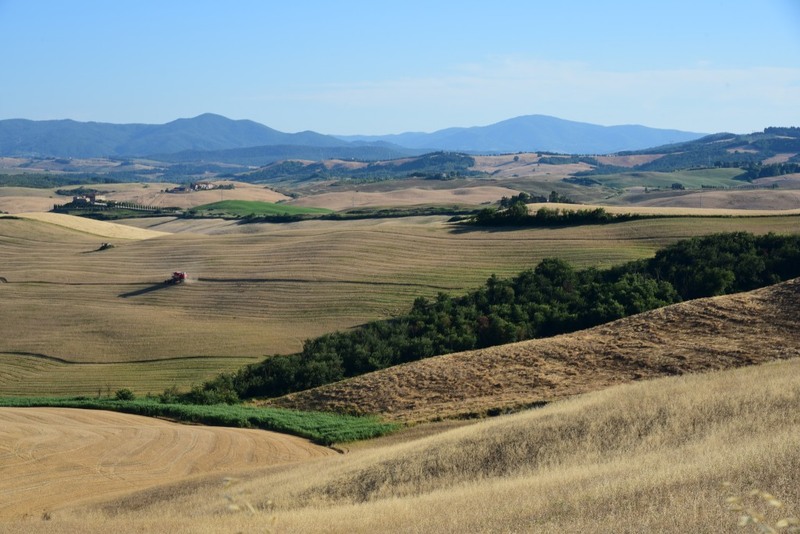 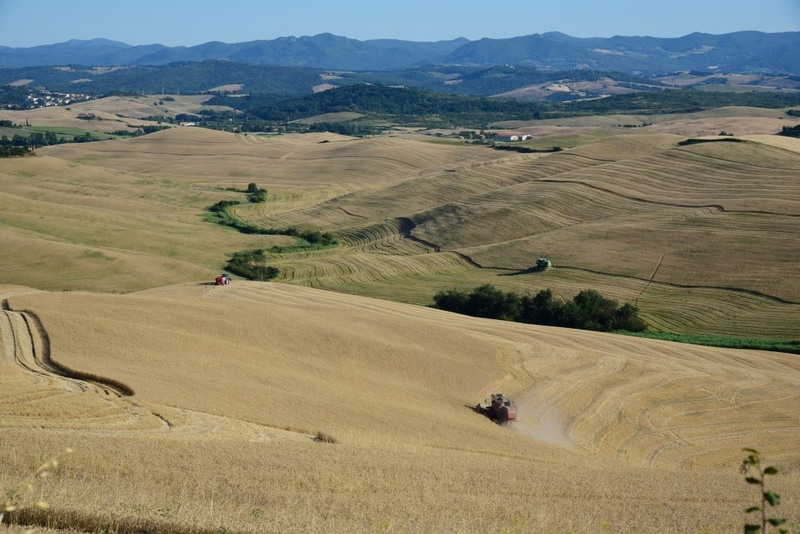 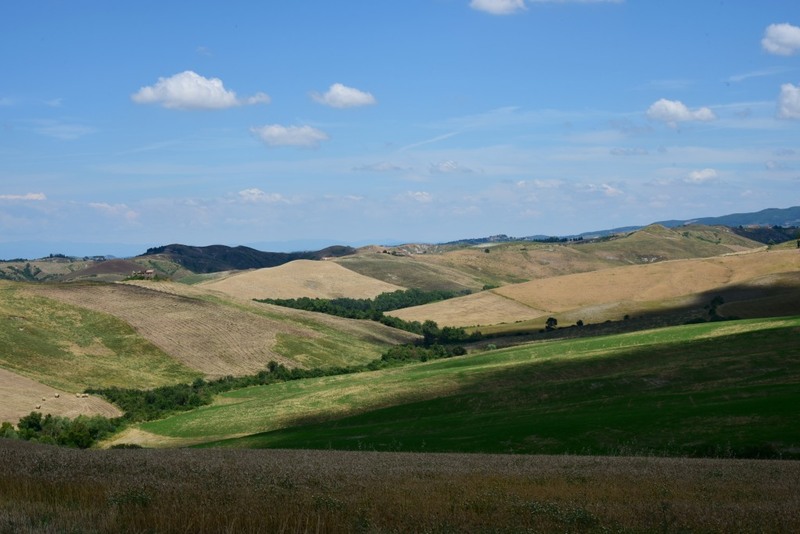 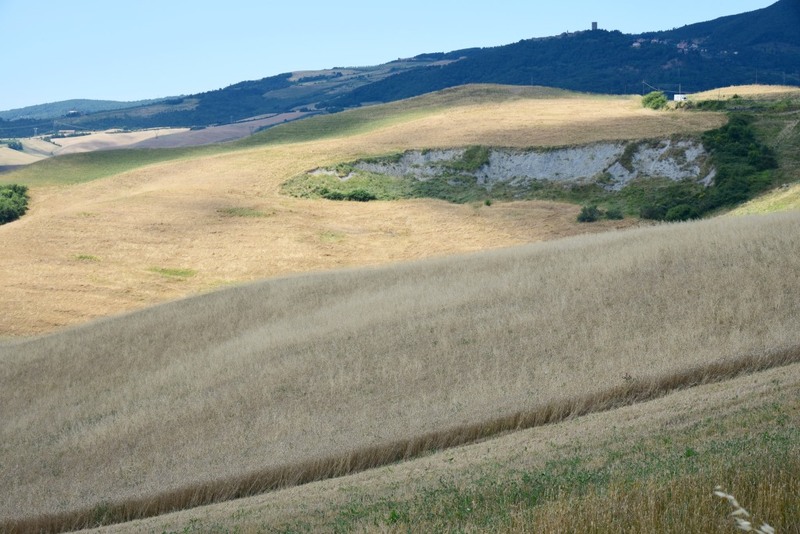 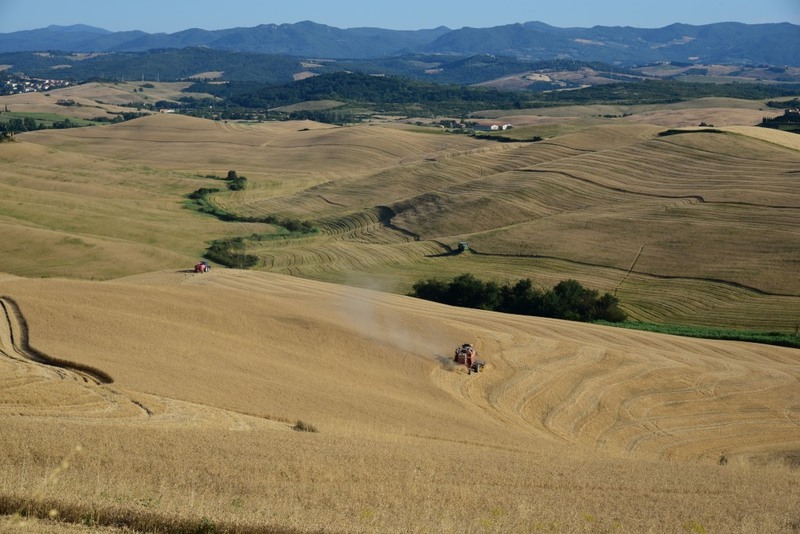 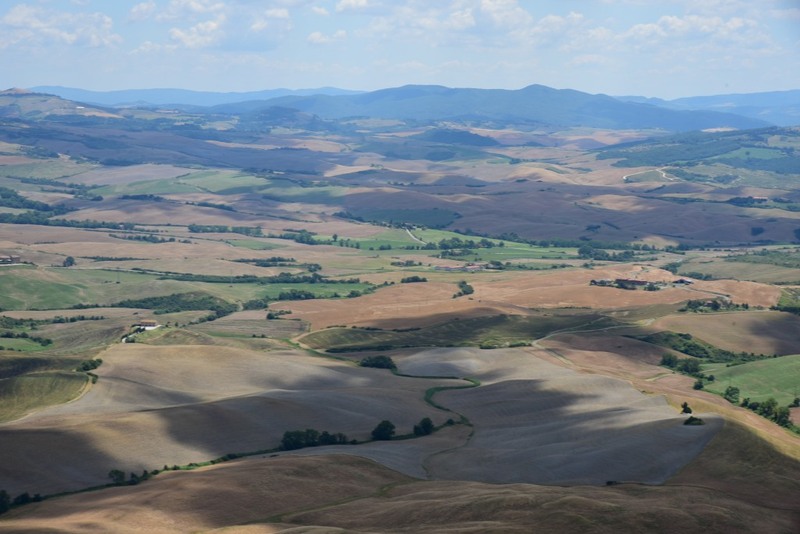 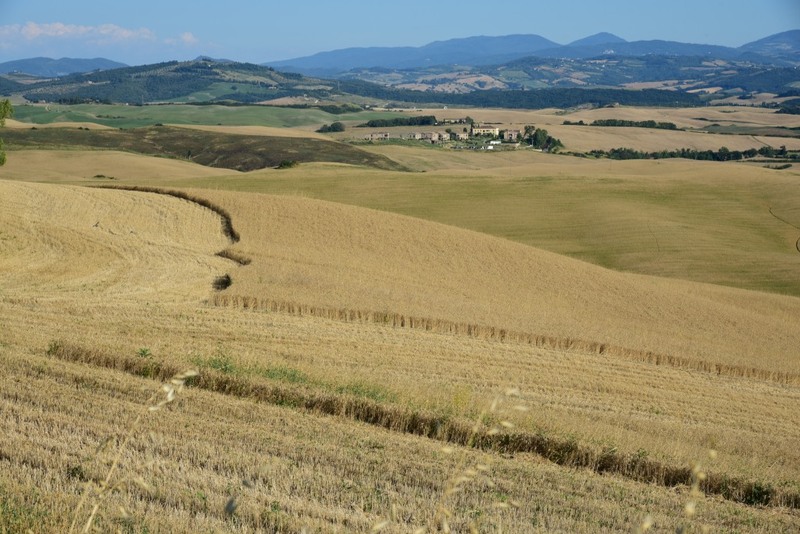 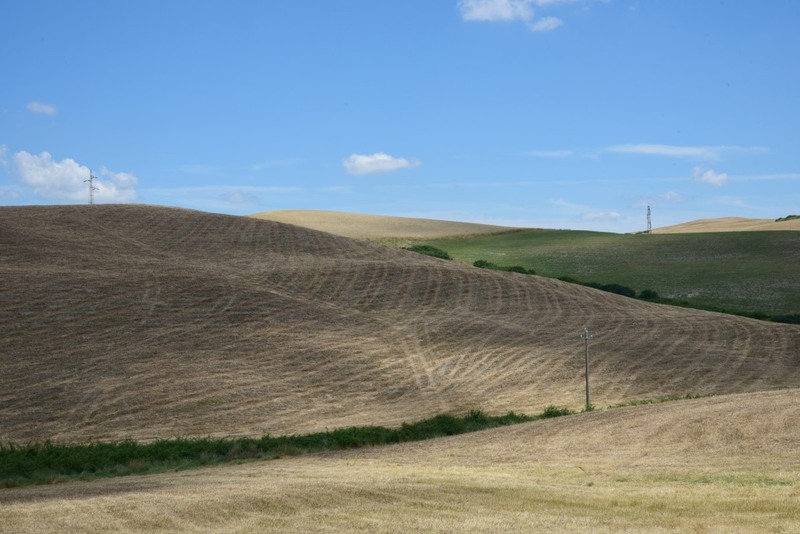 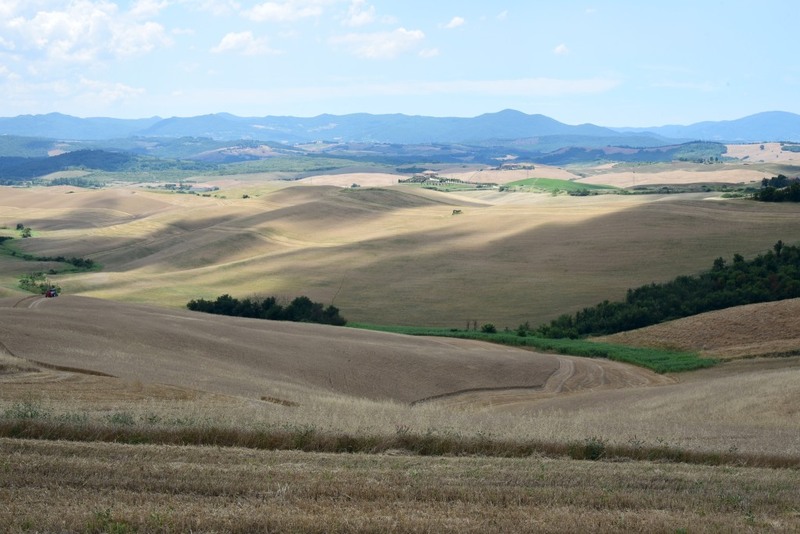 Dramatic rolling hills covered in wheat fields pass by me on the return trip, followed by one final painful climb up the mountain to to Montecatini Val di Cecina. 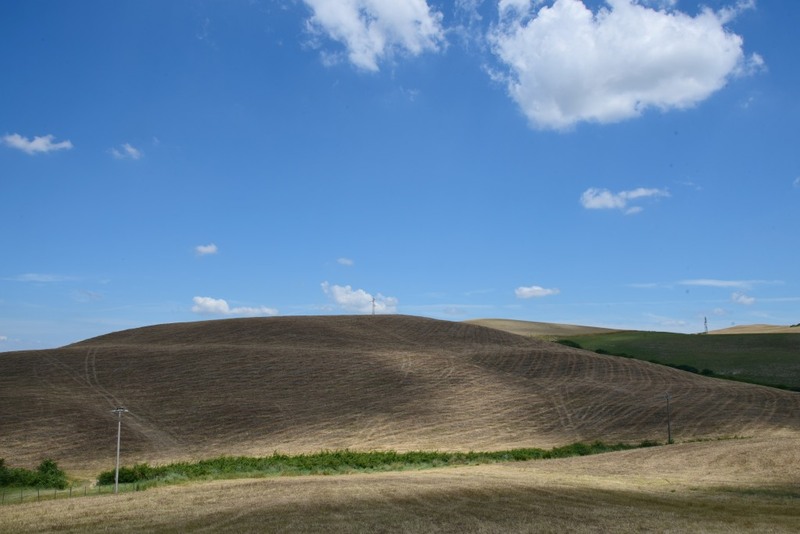 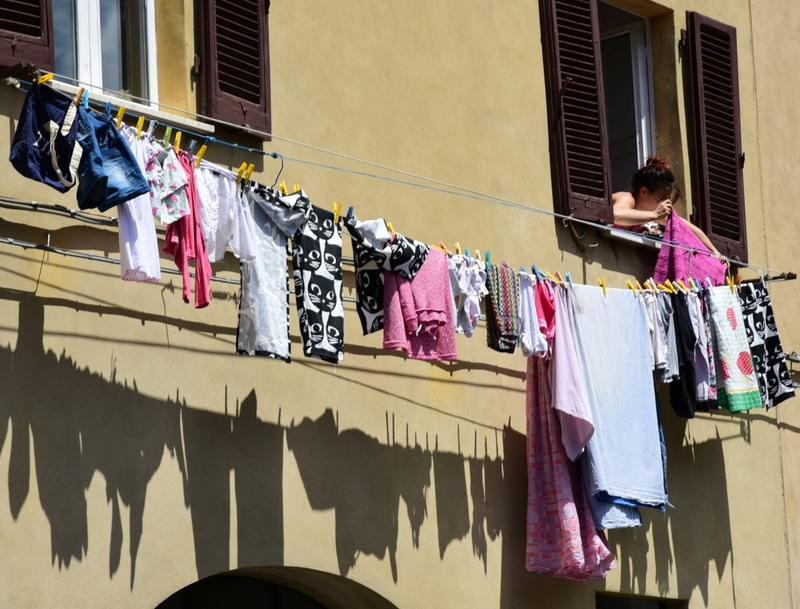 (Narrative excerpted from Wikipedia and www.initaly.com).